Our range of Area 8 polo shirts has been incredibly popular over the last two years and so we are planning a new order for 2019. The distinctive purple colour is bright, smart and instantly recognisable as Area 8! We currently have a few polo shirts already in stock and will be making another order towards the end of March. 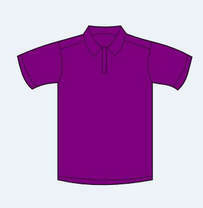 Competitively priced at £24.50 each (£20.50 for Junior shirts), these polo shirts are an eye-catching and distinctive purple with white embroidery on them. They have the SSA logo on the front left breast and the words 'Area 8' on the back. These polo shirts are available for all members of Area 8, regardless of whether you compete or not - we hope that everyone will want one! Pre-purchased polo shirts will be available for collection at Area 8 events during the year by arrangement free of charge. Alternatively you can select the postage and packing option if you require your item(s) posted to you. Thanks go to Sue Pashen for organising these. Enrol now and start collecting your points! Following the success of these awards over the last three years, Area 8 will once again be running their own Performance Awards for 2019, kindly organised by Sue Pashen. The best thing about these awards is that everyone can have a go - you don't have to compete as there are also leisure and hacking awards too. With many thanks to our generous sponsors without whose contribution we would be able to offer such wonderful rosettes to all our participants. Please send a5 SAE to receive your card, or collect from Area 8 events. Prizes will be awarded at the Area 8 New Year's Party which will be held in January/February 2020. Entry is only £7 for the year. You will need to send in an A5 SAE to receive your card (address will be provided upon receipt of payment) or you can arrange to collect your card at any of our SSA Area 8 events. More information can be obtained by emailing ssa_area_8@outlook.com . One card per horse/pony & rider combination. If you ride more than one horse/pony, you may enter more than once - you must enter each horse/pony separately as separate cards are required. Enrol now by using the PayPal button and begin collecting points! 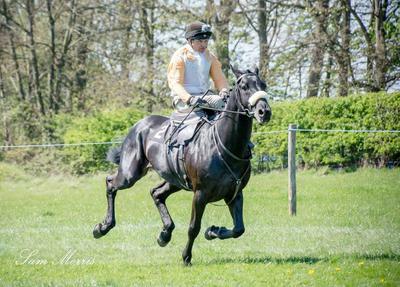 In February I gave my mum Jeneen Schive the challenge to enter the Mature Riders class at the National Side Saddle Championships (a heck of an ask for a happy hacker!). Well, she only managed to pull a win in her section out of 15 competitors, which we truly were not even hoping for! If this wasn’t surreal enough, she then went forward to the championship which included the top two placings from three sections of the mature riders which she also won. We both had tears of joy when the judge pulled her in as it really is an unbelievable achievement. She had never competed in a show ring in her lifetime prior to this. 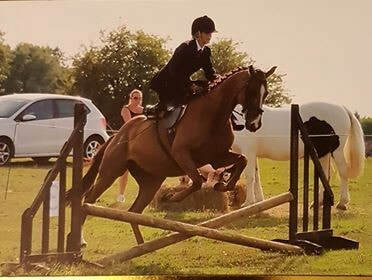 Before this competition she had rode Smurf side saddle a total of five times (1/2 hour a go) in the school and twice out hacking to help build stamina of posture. Prior to this she had not sat on a side saddle. Smurf is established at what he does, but can still be difficult at times in the ring and can be very different to how he is at home. Although she has watched me for many years, it is very much different to riding in the ring yourself and being able to deal with other competitors in the go round (ring etiquette). All in all I was extremely proud with how she tackled this challenge, managed to listen and take on board instruction from her own daughter (which I thought we might have had a few issues with) and pushed herself beyond her comfort zone to now have an achievement that will stay with her forever. At the age of 52 if my mum can do it then anyone can. 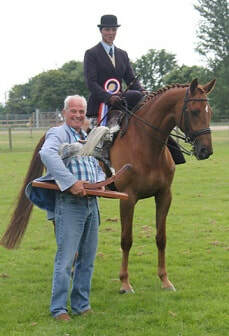 All it takes is an open mind, the ability to take criticism on board and an ex side saddle champ as a horse and trainer. Super proud of you mum! A special thank you to Tanya Chapman for all your help and saving the day with your sewing skills when my mum ripped off her jacket button just as she was mounting before the class. Also to Jane Lavington who has helped in so so many ways this year in helping me get my mojo back with Smurf and improving his way of going on the flat to the point that my mum can even step on board and find him easy to ride. SSA Area 8 AGM - Sunday 21st October 2018 - Riding in Rajasthan - "a Gallop through history"
​Caroline’s presentation is colourful and lively, full of history, tall stories, anecdotes and information about riding the indigenous horse breeds of India. Hear about the culture and traditions of horse riding in India, the present day standards and what the future holds. 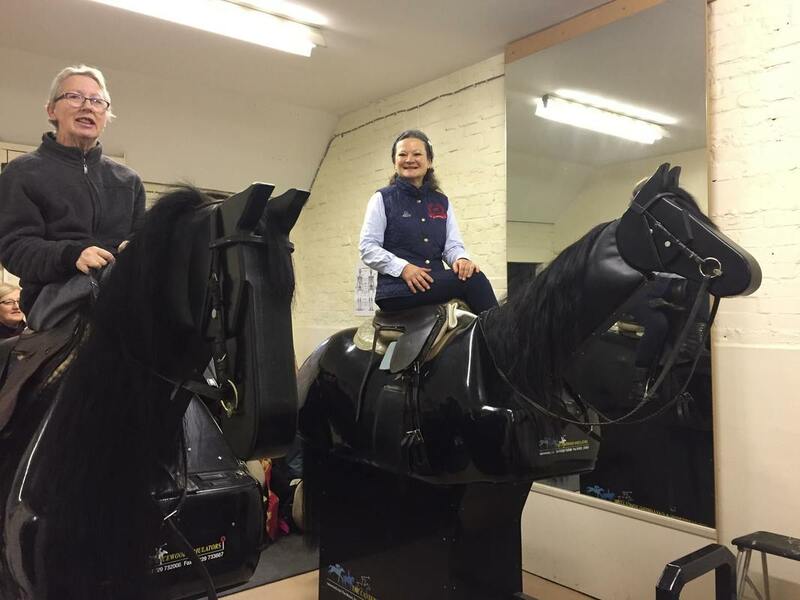 Caroline’s talk is of equal interest to non-riders providing a first-hand insight into modern day life in rural India, the fairs, festivals and role of horses in Indian society. The Bit Donation Scheme aims to eradicate the medieval and horrendously sharp and cruel thorn bit that is still in common use in rural India today. If you have any bits (old or new) 4.5” to 5” only, please bring them along to donate. Over 2,000 bits have been donated so far to 13 rural fairs in 4 states, to relieve unnecessary suffering of horses in India. Most of our saddles are old and can't be easily reflocked, so don’t be disturbed or put off if you need a riser pad or similar to create the correct balance. New traditional panels take a long time to settle and multiple reflocks to get right before they can have a linen stitched in to hold the final shape. That is a process for the patient and dedicated, and a skilled saddler/ saddle fitter. Wickham pads are great for the wide and flat backed horses, but the correct felt is not easy or cheap to find and again needs a skilled saddler to cut and fit. 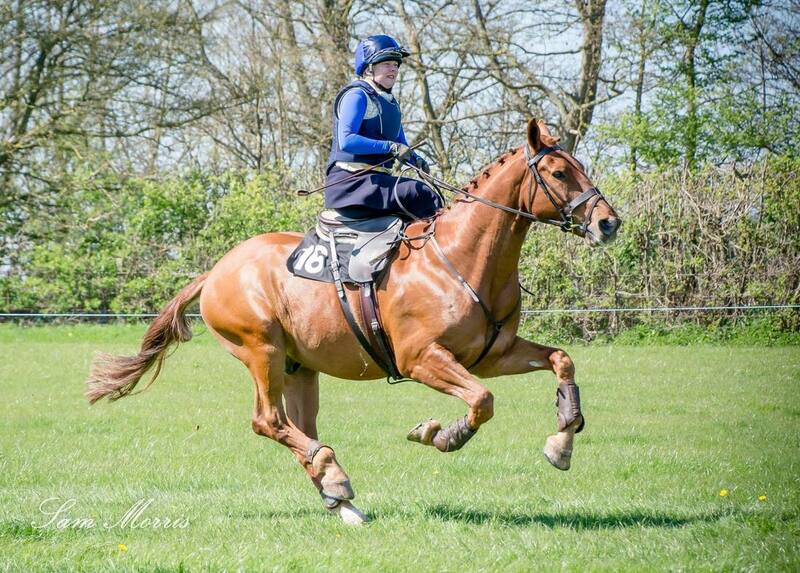 Any changes or major repairs to your saddle needs specialist, professional and skilled work. Old girth straps may look safe, but what are they attached to? Old webbing may not be as robust as the leather. It is always fascinating to see if the original paper plate with details of the maker and first owner is inside your saddle when repairs such as replacing girth straps are done and the panel dropped out. These saddlers also know what girths and buckles are correct, can create correct shaped queens and pads and know that we need extra long reins! Treasure your saddler and make the most of their skills. Most of them do side saddle work for the love if it and certainly not for the money. A final note of caution. 'Ordinary' astride saddlers who haven’t trained and worked on side saddles, can, with best intentions, sometimes create problems that takes major specialist work to correct. 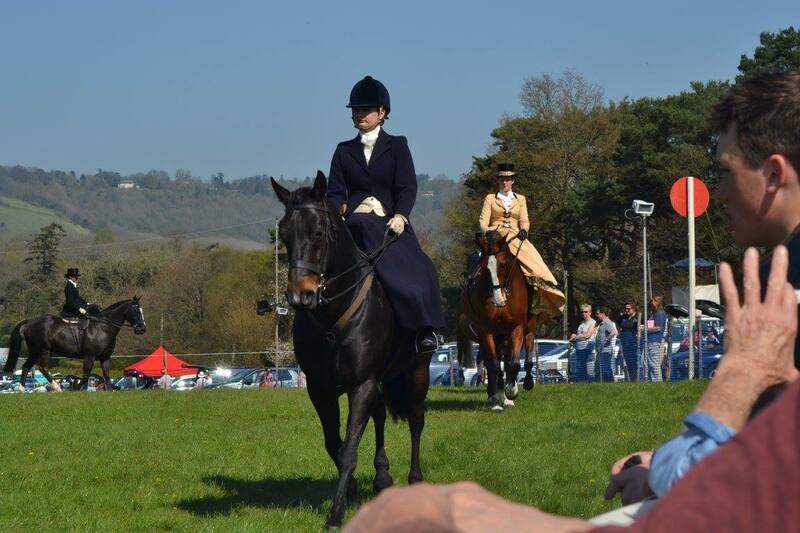 I am a member of The Side Saddle Association and I have done a couple of events this summer, which I very much enjoyed. I have not had my saddle very long and consider myself very much a beginner but Whisper and I do love jumping. 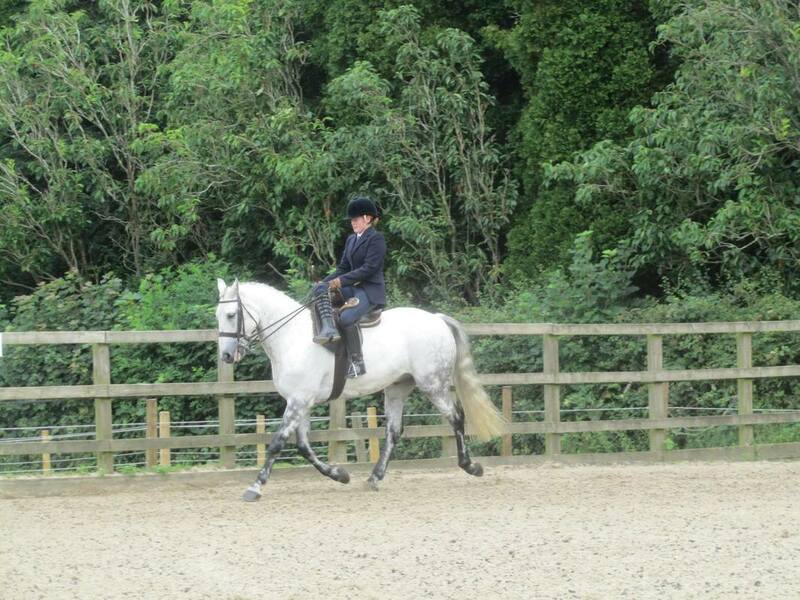 I hope to do a lot more side saddle shows/training days, I have actually only had one lesson, Angela Winter came to see Whispy and I in June and was very helpful. Also, at the two events I have done I got loads of great feedback and advice. I have been doing all the shows and dressage I did before but now on my side saddle, I am absolutely loving it. 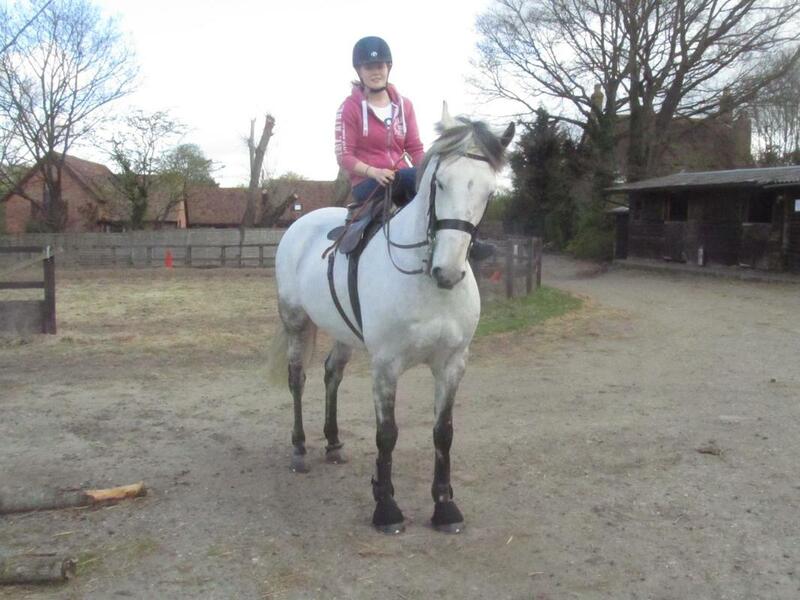 I am so lucky to have Whisper, he took to it straight away and really looks after me. 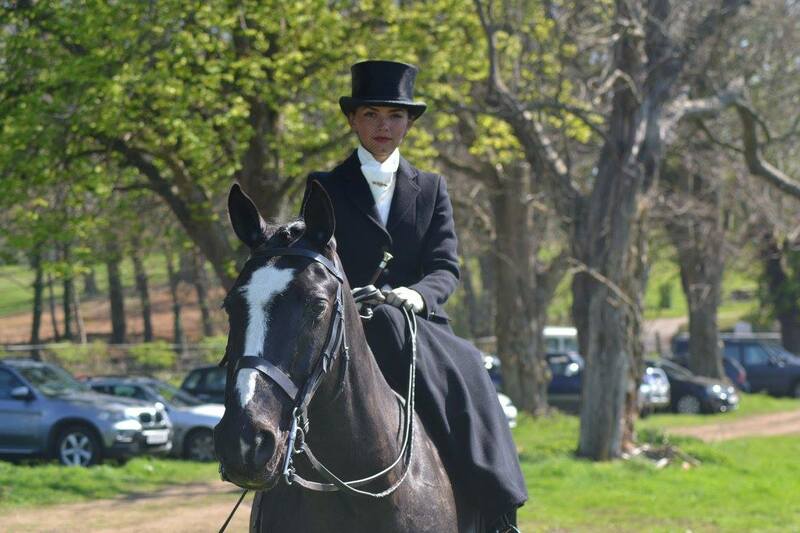 I have dreamed of riding side saddle since I was a little girl, finally living my dream. 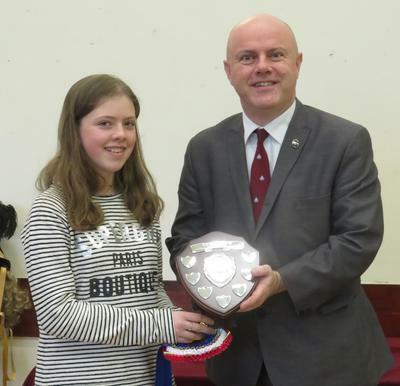 Kate Hewson was thrilled and rather surprised to win the Championship and Rocking Horse Trophy as there were several very strong partnerships that had also had good results. Kate played her joker on the first class, the Junior Equitation which they were very lucky to win against four other juniors, followed by a second place in the Concours d'Elegance, then in the Best Horse or Pony an uncharacteristic wrong leg in Harry's individual show resulted in a third which was disappointing as Harry otherwise had been foot perfect all day. The final Costume class was a difficult choice for the judge and Kate was pulled third again. Kate and her mum were untacking Harry ready to go home when they were suddenly called back for the presentation. This is the first season that Kate and Harry are competing side saddle together so to win the Area 8 Championship was a great achievement. Sadly they were unable to compete at this year’s National Side Saddle Show as it clashed with the BD Youth Home Internationals where Kate represented England on her other Welsh Section B, Laithehill Flute. Kate and Harry’s next challenge is working on improving the fluency of show jumping Harry side saddle. Full results from the summer show are now available on the results page. Members may be interested to know that the Championship trophy of a beautiful miniature rocking horse kindly donated by Stevenson Brothers Rocking Horses, Kent in memory of their sister and founder Area 8 member Lesley Mitchell was first awarded in 2014. ​Further details about the trophy and Stevenson Brothers can be found on their website. 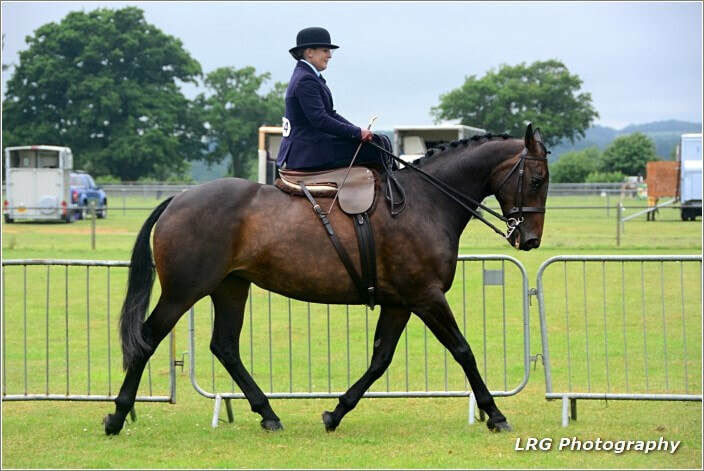 Members supporting the three affiliated side saddle classes included Joeley Elphick on her own Ozark. 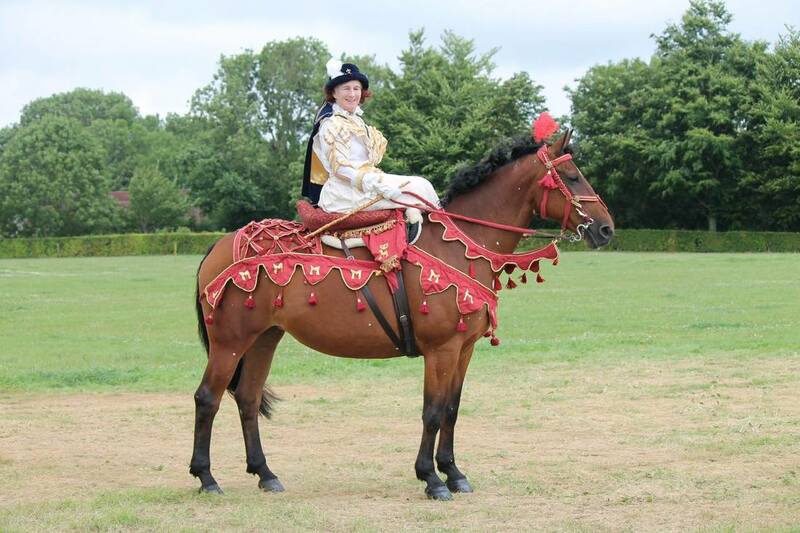 Joeley was overwhelmed to get second place in the Side Saddle Costume Concours d'Elegance wearing a costume described as Lady Montresor, another lady famed for wearing her husband’s military jackets. This achievement followed last year’s struggles including an accident in the lorry park at Kent. 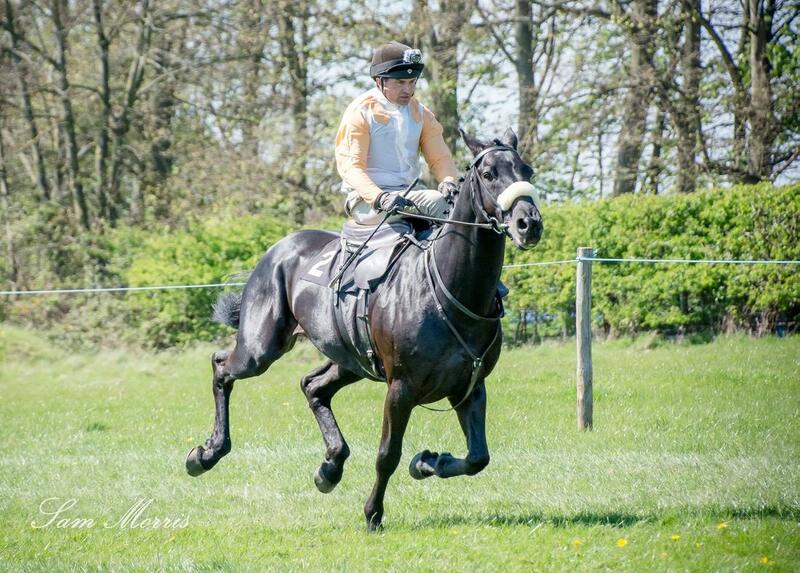 Joeley has been riding side saddle on and off for about five years but had a year off due to a car accident. 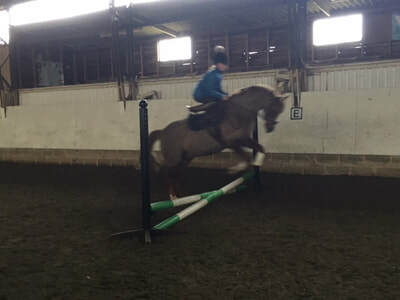 She has been having lessons with Morgan Schive for just over a year. Joeley works as a nurse practitioner for her local hospital so sometimes struggles to get to events due to her shift pattern. Joeley and Oz also enjoy a bit of jumping and hunting side saddle too. Joeley paid tribute to Jess Crook for all her support and Morgan and Jeneen Schive for the lessons and encouragement. Full results of the three affiliated side saddle classes can be found on the Heathfield Show website. It was great to see many of our Area 8 members out at Royal Windsor Horse Show enjoying themselves and flying the Area 8 flag in fine style. 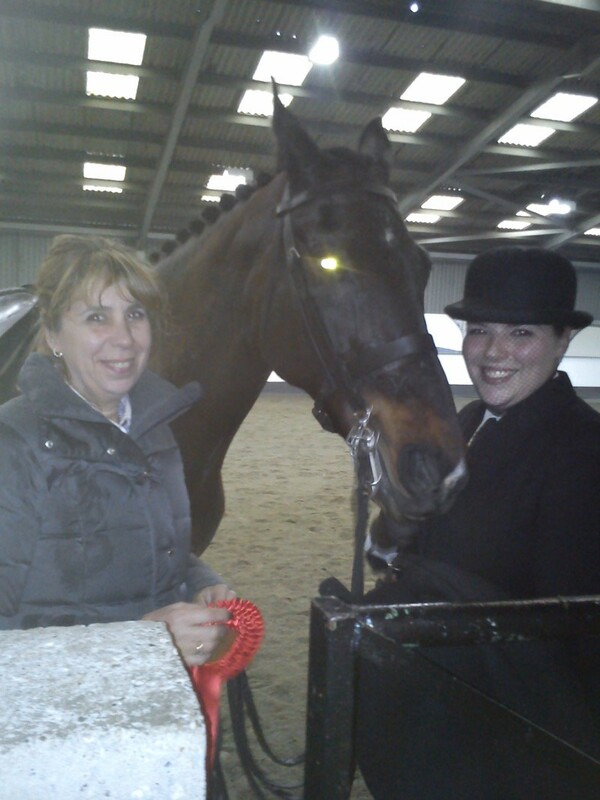 Congratulations to Esther Rostron and Penstrumbly Our Abram on their foot perfect performance. They wowed the Judge, former SSA President Maureen James and claimed the SSA Concours d’Elegance class for the fourth time no less! It was wonderful to see both line ups contain a good number of Area 8 members - well done ladies! Congratulations also to all of our Area 8 members competing there over the week, bringing home some fantastic results both in the SSA classes and others – this is always such a special show in a fabulous and unique setting, we love it! Members may have seen the recent article in Local Rider April/ May 2018 about Area 8 member and Area 8 former committee member Daphne Poupart. 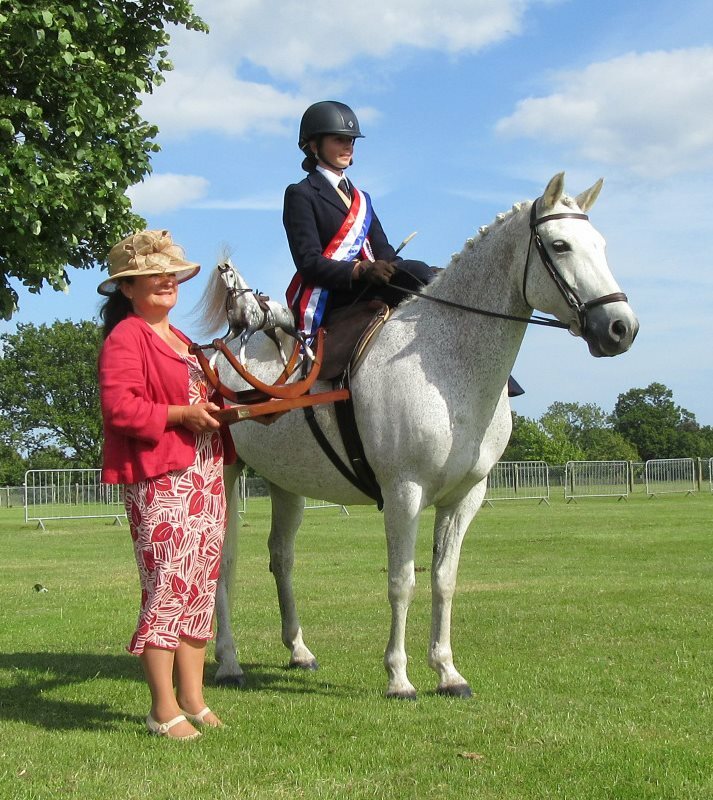 Horsham and District Riding Club have always been supportive of side saddle riders by putting on classes at their annual show and welcoming side saddle riders in other classes. 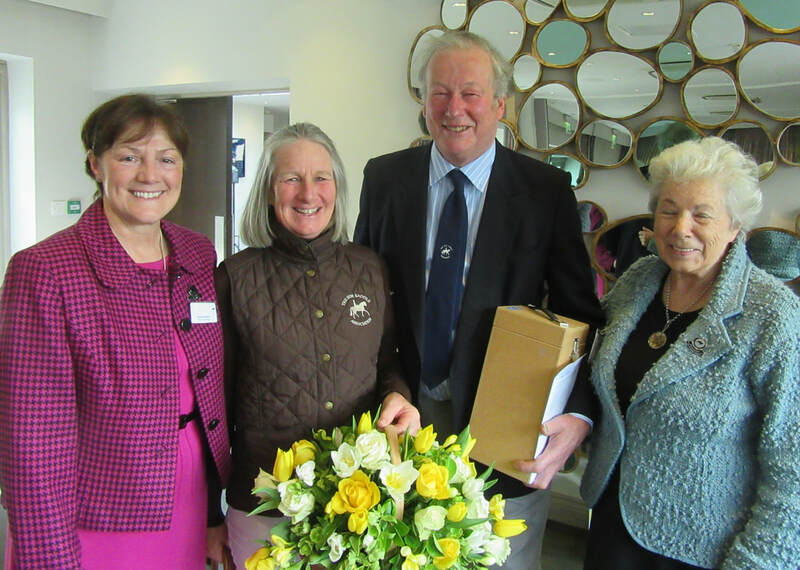 At the club’s AGM in November Daphne was presented with a side saddle bronze trophy by Harriet Glen with the silver plate engraved "Presented to Daphne Poupart in appreciation of 50 years great devotion to Horsham & District Riding Club 1967-2017". As well as a celebratory dinner Daphne also marked HDRC’s Golden Jubilee year by presenting The Golden Jubilee Salver for the Side Saddle Champion at their 50th Open Show last July. 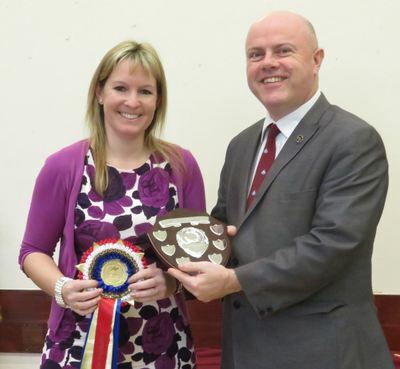 It was won by Claudia Felstead riding Subaltern Will. Side saddle classes will continue as usual at this year's show to be held on Sunday 8 July. Further details can be found on HDRC’s website. 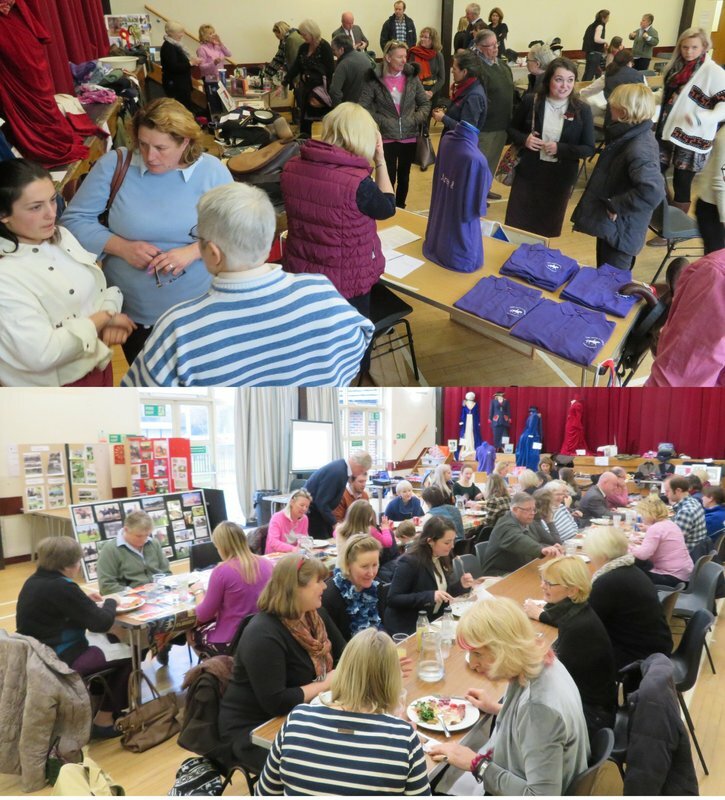 ​Our annual spring show was organised by Claire and Valerie Lewis. Huge thanks to judge Sarah Hislam, steward Catherine Hislam and Helen Hall who also helped on the day. We could not run shows without the generous support of our sponsors and we were very pleased that Joyce Dellacasu was able to present the rosettes and trophies. Eleven combinations took part and there was a fair spread of experienced and novice riders. Riders were supported by friends and relatives and there was a good number of spectators who braved the cold of the indoor school. The rain soon came but we were able to keep riders as dry as possible in the indoor school by a little juggling of classes. The Championship Shield and Sash for the competitor gaining the most points was won by Nicole Heinisch. 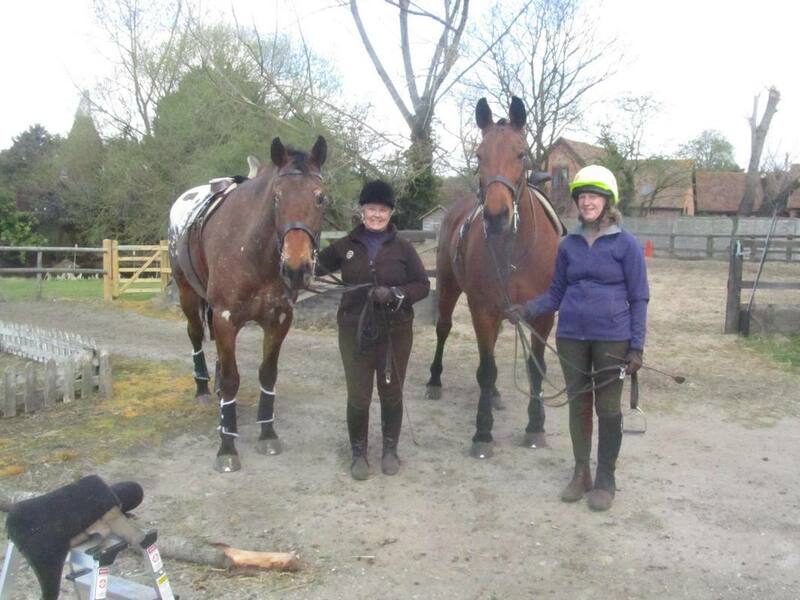 A wonderful time was had by all on Saturday at our start of season Brinsbury clinic kindly organised by Belinda Wilkins. A full clinic started with our ever enthusiastic junior members. Panel judge Sue Pashen took the youngsters through: how to get the best out of the collecting ring, what to expect in the show ring, what the judge is looking for as well as the importance of listening to the steward. The second part of the clinic were sessions with Vanessa Hood who kindly came all the way from Rugby to teach......and teach she did. Members were thrilled to meet Vanessa, who has such a keen eye, enabling her to help members of all standards, much was learned by all. It was fabulous to speak to everyone afterwards to hear how much they had enjoyed their session. Many, many thanks to Vanessa and Sue for providing such excellent tuition. Also thanks go to our lovely members who were so enthusiastic. Special thanks to Miles Wilkinson who made super cups of tea all day and made me a heavenly sandwich! Thanks to Belinda too for planning and organisation as well as riding too, that takes great skill to do! It was great to see many fellow Area 8 members, as well as members from around the country, albeit in reduced numbers and our Patron Jane Holderness Roddam, braving the snow to make the journey up to Solihull for the SSA National AGM 2018. 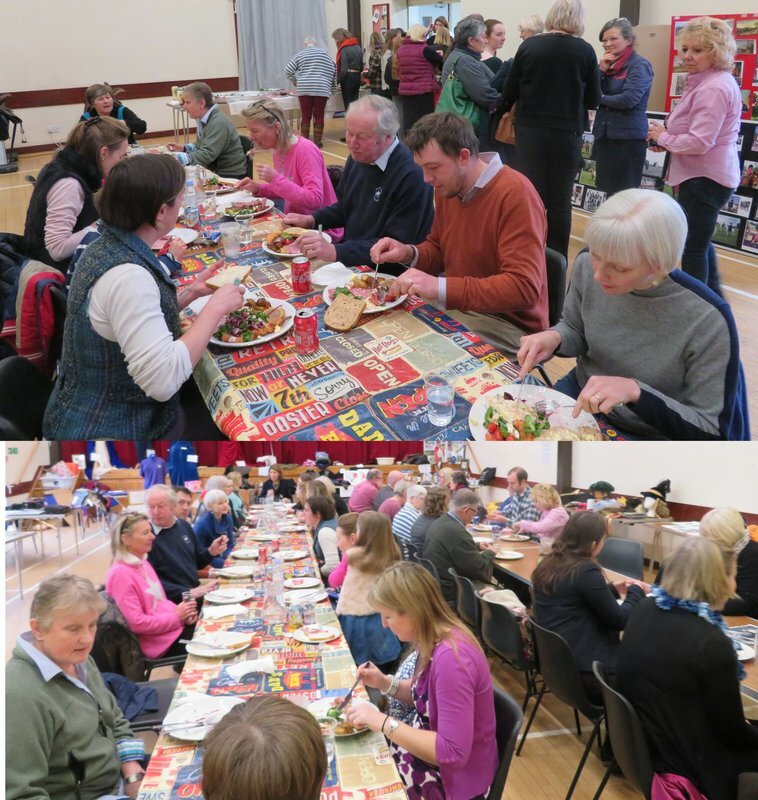 Once the formalities of the day were over which included the performance awards, brilliantly put together by our own Area 8 member Rebekah Marks-Hubbard, members enjoyed a delicious lunch with much socialising. The afternoon delighted all with an informative and well put together 'talk' on competing abroad. Area 8 member Julia Izzard presented a really good afternoon full of easy step-by-step handy hints on preparing your horse to travel across the Channel and what to expect when arriving at Haras du Pin. It is hoped this will inspire members to think about travelling for this fun and enjoyable show. Congratulations to all officers re-elected, all performance award winners and especially to our National Secretary for organising the day. Thanks also to Side Saddles for sponsoring the awards and for bringing the stand to the meeting, enabling members to do rather a lot of shopping! 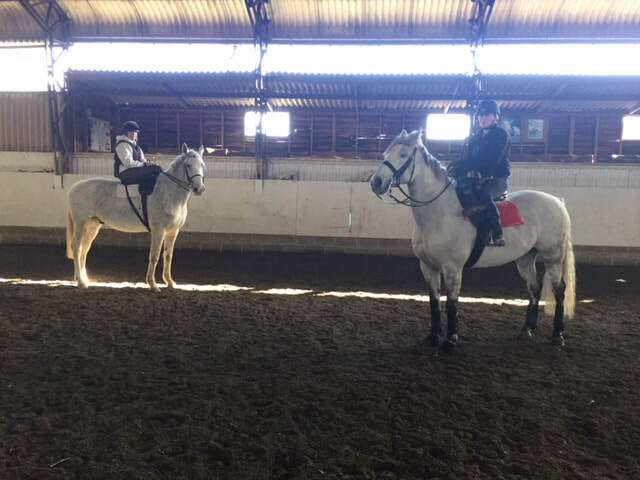 This was our first clinic of the year and the opportunity for riders to benefit from tuition from Area 8 member Samantha Boxall proved very popular - so much so that we were able to put on and fill and extra session! Sam is a regular competitor and judge and has been SSA rider of year no less than five times. Her experience and ability to bring the best out in horse and riders was evident today. It was so lovely to see many new faces today as well as some regular riders and one or two returning from a break. A range of capabilities and experience was catered for but what every single rider had in common was bags of enthusiasm, effort and a keenness to improve - lovely to see! 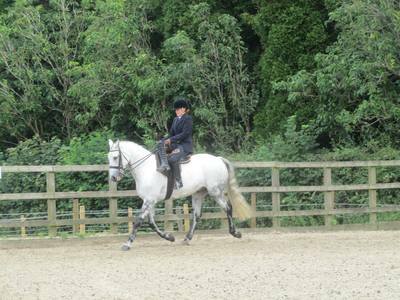 Some riders had only ridden side saddle a handful of times before, some had a new horse or pony, some overcame a battle with nerves and it was great to watch one rider overcome the fear of jumping on the left rein! Well done each and every one of you! It takes a lot to get out and about, particularly at this time of year! Every combination improved during the course of their session and all went away with a smile on their face and something to practice on at home. I would like to thank all the riders for coming to support this clinic - some of you travelled a long way, all the helpers and ground crew who all lent a hand to help others on the day and of course to Sam for giving up her day to teach. 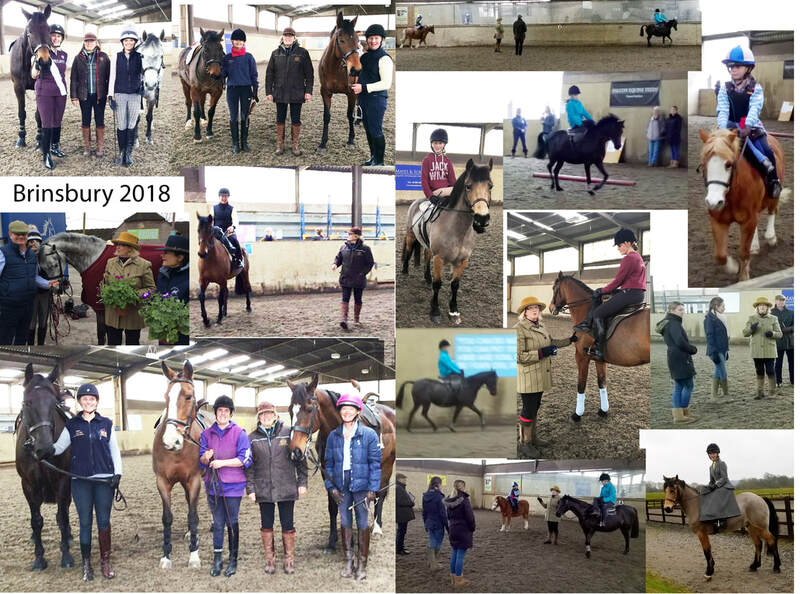 What a super start to our mounted events for 2018 - it's sure to be an exciting year! It certainly was a memorable occasion. 30 Area 8 members accepted the kind invitation from Thea de Boer to gather at her beautiful home in Pulborough for drinks and delicious nibbles in memory of Valerie Millwood. A very warm welcome was given to all and everybody enjoyed the relaxed and friendly atmosphere created on the day. Those attending included instructors, judges, commentators, stewards, saddlers and many more. Photo albums and films going back to 1987 were on display and sparked so much interest from all. It was lovely to hear members sharing memories and stories with each other whilst looking at these photos/films. 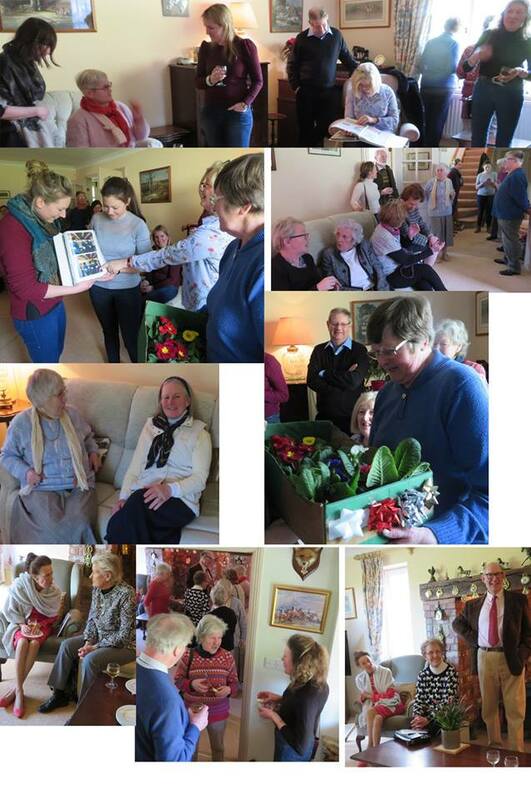 Caroline Daplyn and Samantha Boxall, both pupils of Valerie from 1999, presented some spring plants as a thank you to Thea for the occasion. Special thanks to Thea de Boer and also to Belinda Wilkins for arranging such a wonderful occasion and finding so many photos and films to display. Another cold Saturday with light drizzle saw members taking advantage of being in the warm and dry to ride on mechanical horses courtesy of Amelia Wilborne (BHSII, RWYM accredited coach) and Jo Strange (SSA A and RWYM accredited coach). The two horses one trotting and one cantering had various speeds in their chosen gait and riders were challenged to go up a speed by our coaches. It was interesting to note which riders were used to the different movements and to spot the rider used to a cob or a thoroughbred. 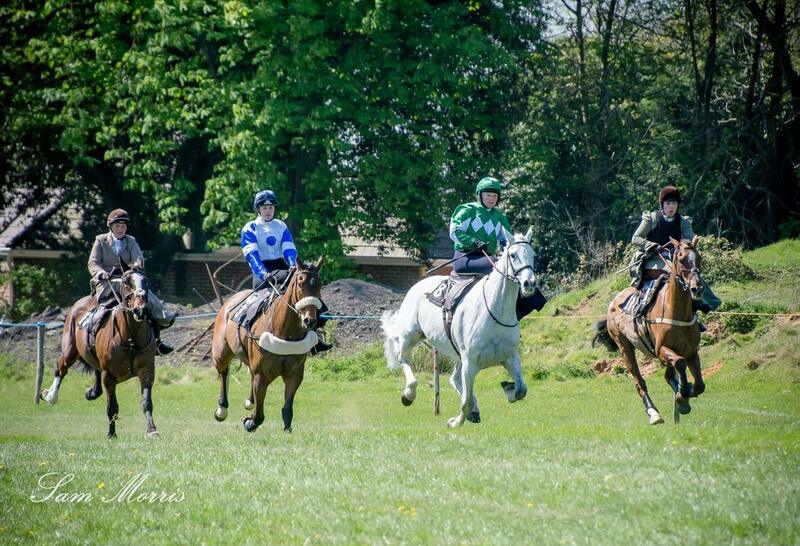 Some of those taking part had not ridden for a while due to no horse/ pony, injury or illness. 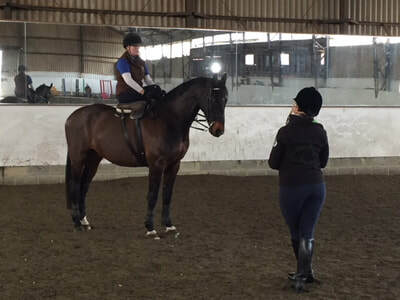 These sessions provided a safe environment to get back on board, really practice position and correct bad habits and known faults or weaknesses, as well as being a confidence giving exercise without worrying about what the horse is doing or not doing. Certainly one rider (Jeneen Schive) had never ridden side saddle before, despite being groom for a number of years to her daughter Morgan. It was great to see her on board and enjoying herself! The slots for this session were very quickly filled with a number of members on the waiting list. All those taking part thoroughly enjoyed themselves and there is certainly enough interest to run further sessions. Riders may also be able to bring their own side saddles which as we all know has a huge difference on your riding. Thank you to all those who supported this event and those who came along as drivers or supporters to our members. Winter greeted us on the day of our Area 8 New Year’s Party with a light flurry of snow – that wasn’t in the plan! Thankfully it did not settle and so did not impact the arrival of our party goers for this event which was so well attended that it was at capacity. The village hall in Crawley Down was jam packed full of memorabilia, costumes, displays and an overloaded bring and buy table offering lots of goodies for all! Both members and non-members enjoyed warming tea and coffee on arrival before settling down to three very informative presentations. With many thanks to our three presenters who did a fine job in captivating their audience. Tim Pashen kicked off proceedings by giving a well informed talk about stewarding of side saddle classes, covering both the role of the steward and how, as a competitor, you can assist in the smooth running of a class. Tim then stepped into his ‘interviewer shoes’ and ably interviewed Area 8 judge and competitor Mrs Sue Pashen, resulting in an enlightening discussion about what the judge expects to see and how you can improve your overall picture (and placing) in concours d’elegance classes. The audience asked many questions throughout and lots of very interesting viewpoints were shared and discussed. The third and final presentation saw Kirsty Bergman, with skills worthy of a Blue Peter TV presenter, perform some fantastic ‘live’ practical examples of how to dress a safety hat for costume classes – making it all look so easy! The audience were certainly captivated by her many fine ideas and suggestions and I’m sure we can expect to see some fine newly dressed safety hats out this year as a direct result – thank you Kirsty! Next came the presentation of the Area 8 performance awards, kindly run by Sue Pashen. 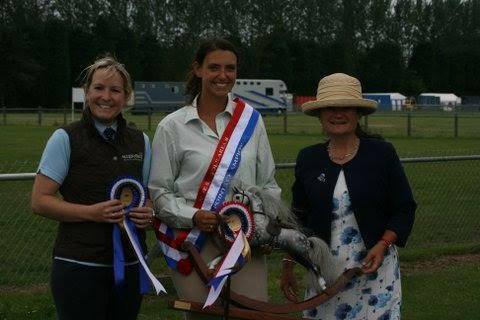 Every participating member received a beautiful rosette, with thanks to our very generous sponsors. Congratulations to each of the category winners and to all who took part. Results are listed on the results page of the Area 8 website. 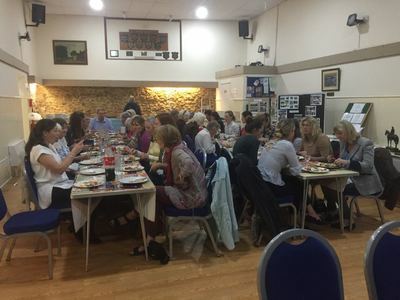 A delicious Winter buffet style lunch was served and the food was enjoyed by all – so many empty plates and compliments for our regular, well-loved caterers ‘Shovelstrode catering’ certainly ticked the box! Plenty of chatter could be heard around the room as members and non-members caught up with old friends and formed new acquaintances. After lunch there was time for all to peruse the display boards and memorabilia. The bring and buy table was very popular seeing many go home with a new ‘must-have’ side saddle item for their collection. Several people also bought polo shirts and entered the 2018 performance awards. 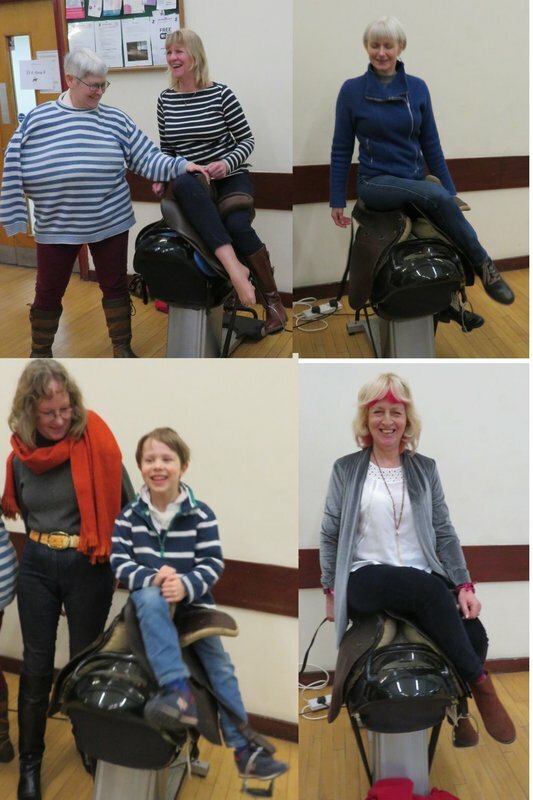 Jockey’s corner provided much in the way of smiles and laughter as both riders and non-riders took their turn on the side saddle simulators (thanks to Jo Strange for bringing these). 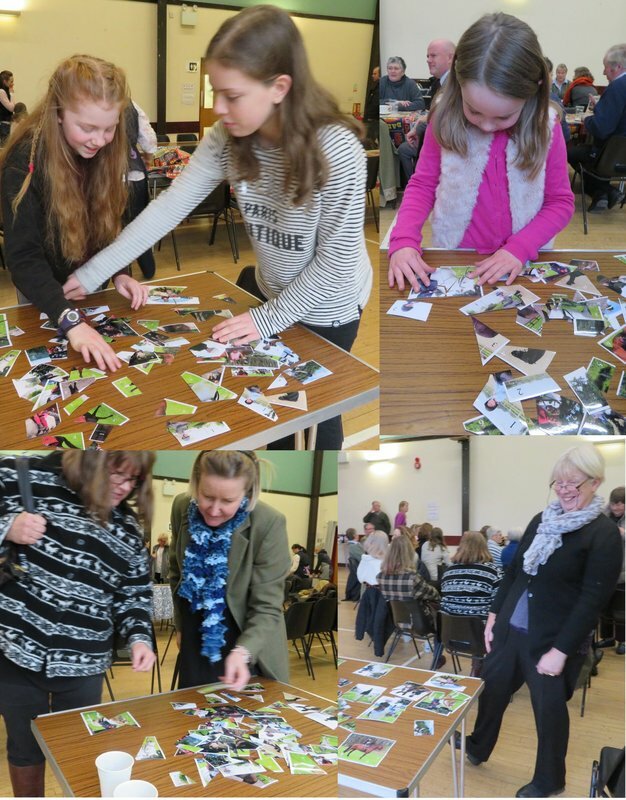 Belinda Wilkins kindly arranged a ‘junior’s event table’ with lots of activities for our junior members to take part in. This was so popular that many adult-sized ‘children’ (including myself) could be spotted doing the picture puzzles throughout the day! Our raffle on the day was well supported and saw many beautiful prizes collected at the same time as raising money for the area – thank you all for taking part. Many thanks go to Madeline Heath for organising the event and her team of helpers who brought items along and pulled the day together. Thank you also of course to all of those members and non-members who came along and made the day a huge success. The results are in! Please visit our results page for details. Got the Winter Blues? Brighten up your winter season by competing on your side saddle from the comfort of your own yard! 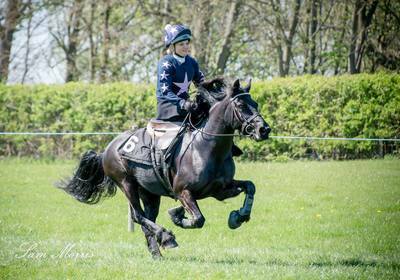 Just So Equestrian Events run two monthly competitions that you can take part in over the winter months that you can do at a time to suit you that doesn't involve boxing up to go somewhere! 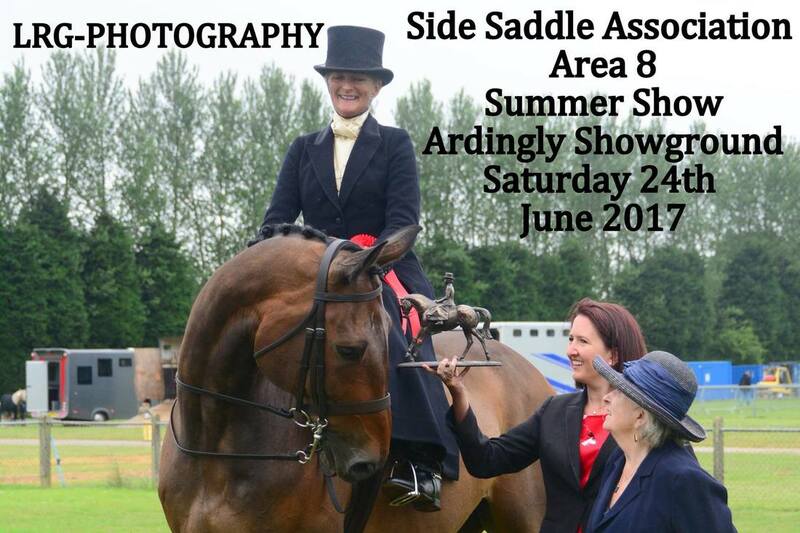 These competitions are not Area 8 events but are open to all to join in the fun (side saddle or astride!). Virtual Dressage offers you the chance to compete from the comfort of your own yard at a time to suit you, win beautiful rosettes and receive constructive and encouraging feedback from our carefully selected team of judges. Entering is simple, all you need is a flat piece of ground with a marked out dressage arena and a digital video camera to film your test. There are monthly competitions with 6 class levels with long and short arena options (Intro, Progression, Prelim, Novice, Elementary and Medium). Entries open on the 1st of every month and close at midnight on the last day of the month. Click here for 2017/18 schedule. Between the Ears is a monthly on line photo competition. With so many riders taking pictures of the view between their horse’s ears with their phones or hat cams, this competition gives you the opportunity to share your photos and win rosettes, with the top three photo's every month going forward to a grand final and a prize for the overall winner in January. Click here for competition details. 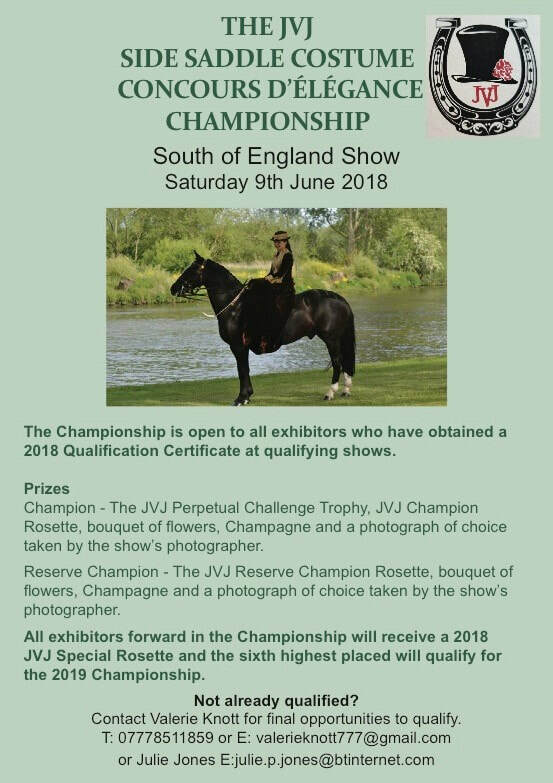 Full details for both competitions are available on the Just So Equestrian Events Website. Get out there and have some fun! As an Area we have a very active schedule throughout the year. These events take time and energy to organise and run, there are a host of jobs to do to put on events. As an Area we are looking for volunteers to help out. This could be anything from finding a venue, organising an event and running the whole day to offering to put on a coffee morning in your home. You also might have a skill such as writing, making tea or enjoy welcoming and helping arrivals park at an event. All these jobs are as important as the next. You do not need to be on the committee to do these jobs, however if you would like to join our committee please fill in the appropriate documents and come and have some fun. You will be surprised at how much fun you will have! If you have a specific event you would like to see put on in the Area please get in touch with your nearest committee member. Please remember there are certain guidelines which need to be met so it might not be possible to hold your event to the exact detail, however it may be possible to come to an amicable altered time table. Area events are for the benefit of our members and it is not possible for our committee to organise events for the benefit of other organisations. Please check the listings below to find your nearest committee member. 2017 has seen the introduction of Junior Rallies in Area 8. Each one is different. 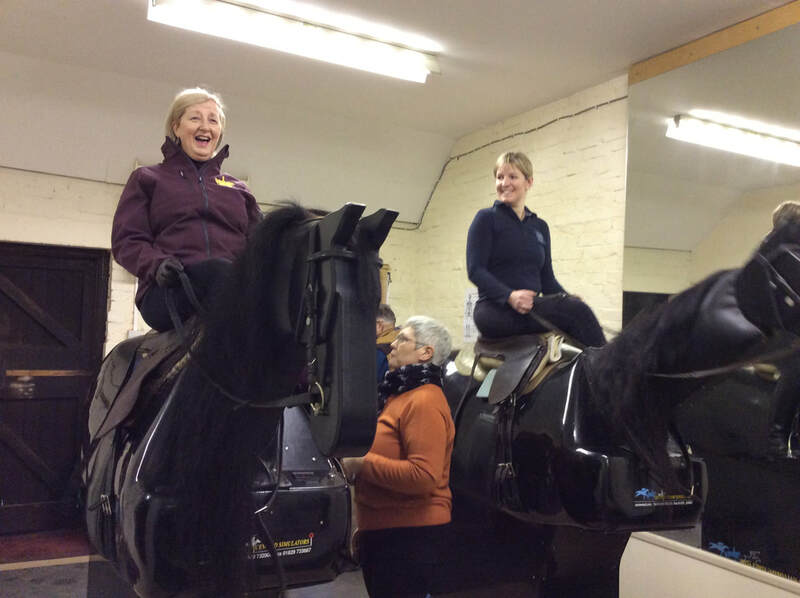 The aim is not only to enable riders to ride side saddle correctly with confidence but also to enable riders and supporters to discuss and swap ideas. The ultimate plan is to create a display team second to none! The Halloween Rally was fun for all. Katie, Phoebe and Molly arrived with their Witch’s hats, Aisla wore a 'Boo' t-shirt plus ghost decorated pony plaits. The activities encouraged correct riding in particular transitions from walk to halt whilst the Witch (Chairman Angela Wells) pointed her broomstick to remind riders of their position. Ingredients (bean bags) were collected whilst bending in and out of the trees (jump stands) and then were dropped into the witch’s cauldron.The cobweb made out of poles on the ground required ponies to step cleanly over them to prevent being caught by the spider. The young riders practiced as pairs and then they joined up to form a quadrille down the centre of the arena. They had to wheel round the top corner. They did it like pros! The age old problem of saddle fitting reared its ugly head. Ponies change shape so much and this time of the year are probably at their roundest. 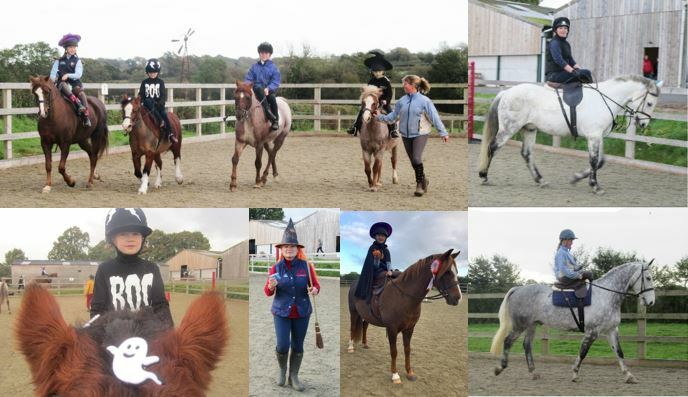 All received their Halloween Fun Rally rosette and orange gourd which one pony secretly tucked into. Next was a chance to pop a cross pole. This was the first time for Emma Hewson who went round for more. Aila Sturrock flew over with confidence and Phoebe Whiting had no problems. All three jumped a straight bar Back in the Tack Room and then all enjoyed the witch’s sweets and chocolate apples made by Molly and Lauren Jones who kindly hosted the event. Molly joined in the activities astride with her young pony. Following the jumping , the winner of the SSA Area 8 Futurity Bursary, Lindsey Bell rode her stunning but nervous grey Connemara to get him accustomed to outings and Lauren on an dapple grey rode side saddle for the first time in public. Both made great progress during the session. All are looking forward to the next rally. Members and their guests gathered together in Godstone for the Area 8 AGM on Sunday 15th October. It was lovely to see so many members out to enjoy the day. Before official proceedings began, tea and coffee was served giving everyone a chance to chatter and relax. The formal proceedings of the AGM meeting then took place, seeing the Area’s matters of business taken care of. Kathleen Botting and Leslie Curphey have both stepped down from the committee during the year and expressions of thanks were given for their contributions to the Area during their time on the committee. The Area is pleased to welcome three new members to the committee – Diane Baker, Madeline Heath & Sue Pashen who will work alongside existing committee members to share and put on news and events for the members of Area 8 (both riding and non-riding). Please do welcome them and give them your support. The presentation of awards then took place, celebrating our member’s many fabulous achievements throughout the year – a particular mention and congratulations must go to Amanda Bernard on claiming the title of Adult Intermediate Rider of the Year. After the meeting was closed, a delicious lunch was served by Shovelstrode catering and as usual, many compliments were received on the quality of the food - thank you Andy & Zoe (and your team). A party-like atmosphere promoted plenty of conversation and chatter over lunch and coffee. Our two guest speakers Nicola Watson and Ian Smart then treated their audience to two finely illustrated, informative and interesting presentations. Subjects were ‘Side saddle tack through the ages’ and ‘Side saddle soldier – HM Queen Elizabeth and the uniformed tradition’ respectively. Both speakers were passionate and highly knowledgeable on their subjects. The enthusiastic audience asked many questions, creating plenty of discussion. I would go so far as to say that everybody in the room learned something and certainly everybody enjoyed the occasion! Thanks to the many people involved in helping to make this day a successful one. Area 8's Susan Lomax very kindly took photos of the event which can be viewed by clicking on the following link. Despite potential for horrendous weather, it held dry and overcast and perfect riding weather for the TRRC show. Tricia Drake kindly came over from Suffolk to judge our side saddle classes and her experience and knowledge was appreciated by all the competitors. The equitation class was dominated by two new members of the SSA, with Sharon Yankoo and Jennie Medlock, first and second respectively, both riding traditional cobs, Pink Champagne (Mikey) and Bric-a-Brac (Brax). 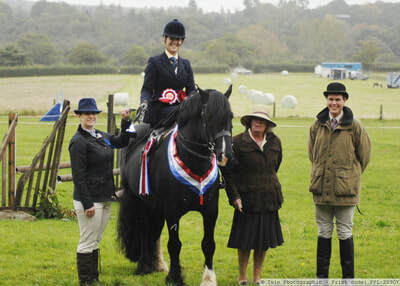 Beverley Wallis took third place on her PRE, so we had a wide range of 'non-standard' side saddle horses, all doing the job well. Moya Payne represented the juniors to win her section on her palomino Tobiano pony, Bubbles. Moya also took the riding club horse/pony class over Belinda Wilkins and the fabulous part bred Cleveland Bay Phoenix Modena (Maddie) who earlier in the day had been placed in the novice working hunter, concurrently taking the side saddle section, having only started jumping side saddle that week! A great achievement and a super example of a ‘can do’ attitude! Jennie Medlock and Brax went on to win the classical and qualify for the BSHA champs in 2018 and then to become the side saddle champion with Moya and Bubbles in reserve. 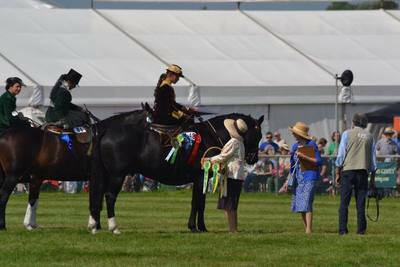 the day was topped off with Jennie and Brax taking Supreme of the show - flying the flag for side saddle riding in style! Thank you to those who came and supported the show. We hope to see you all again next year at our spring and open shows. More photos can be seen on Twin Photography's website (page 6 onwards) and also on Belinda Wilkins' FaceBook page. 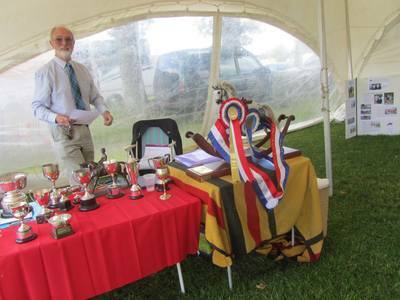 Once again the Edenbridge and Oxted show was a wonderful weekend for our members. Being right in the centre of the Area, it was great to see so many members there enjoying themselves over the whole weekend. Friday night's ball was a magical event with many Area members all stylishly dressed enjoying the four course meal, wine and of course the brilliant ten piece band who played the night away. With Saturday to recover from the ball meant Sunday was great fun catching up with members in the marquee which had transformed into an elegant dining area having been a charming and welcoming show ballroom two days ago. 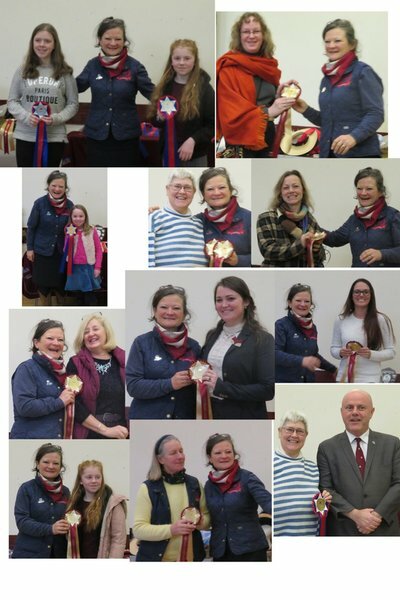 Sunday's Costume and Equitation were well attended, again Area 8 members were out in force taking all three titles: Costume and Equitation – Morgan Schive. Monday's Ladies - a large class - attracting 20 entries, well done Esther Rostron for winning the class and Georgie Steele 3rd overall but taking the HOYS ticket. 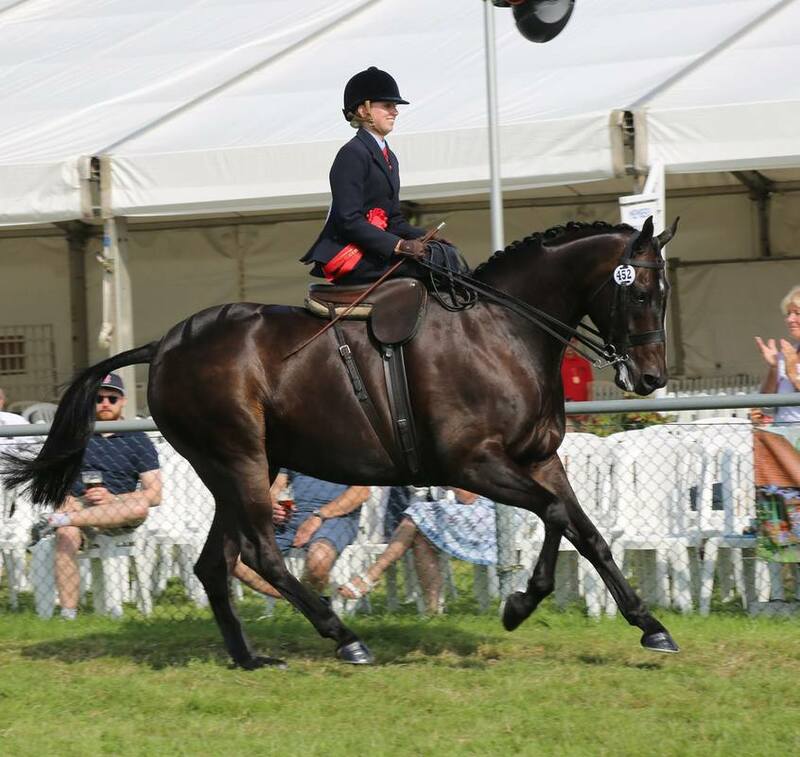 Area 8 members: Sue Pashen – Equitation and Costume judge, Sam Boxall – Ladies ride judge had a busy time in temperatures more usual for Southern Hemisphere country shows, deciding just who should take the placings. 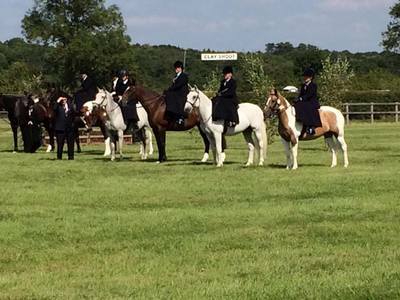 Well done to all our members who took part in the show, the entries were good and all side saddle classes were a joyful sight attracting a large audience of show goers watching from the ring-side. 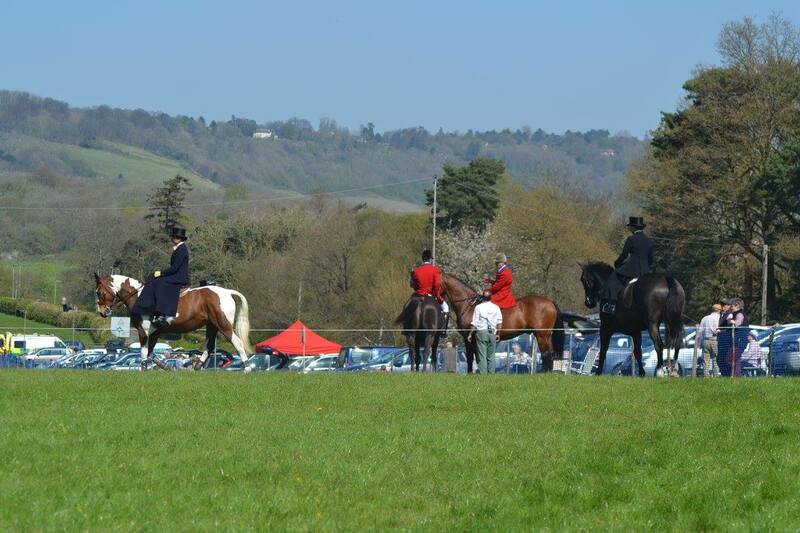 It is always a friendly show, made more so when seeing so many Area 8 members in a variety of capacities such as competitors, judges, stewards, organisers, supporters and many more. Sadly this is the last of our large outdoor Area 8 Agricultural shows for this season, but we can look back at the many happy days we have all enjoyed and think forward to next year's show season. Thank you to Area 8 members Sally Langley, Margaret Teasdale and Area 8 Chairman Angela Wells for putting on this demo, much to the delight of their audience. Sally performed a free style of walk, trot and canter for a group of pc members on her beautiful ISH Bert. The two showed eager members just how elegant this beautiful art of riding is while Bert responded to Sally's light aids when asking for a variety of movements. Sally then removed her apron to show just what her legs were doing - much to the amazement of the young audience. Angela talked the inquisitive members through what Sally was wearing and why. 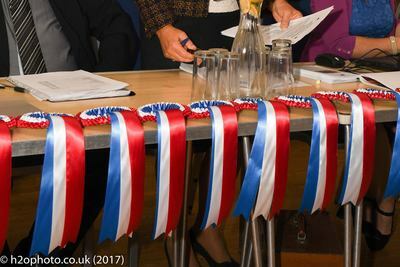 Association rosettes were on display as well as photographs, leaflets, a saddle and girths to go with it - proving of interest to many. There were soon many hands up for "any questions" - as the youngsters were eager to find out: How old was the saddle? How long had Sally been riding? And could Sally ride astride before she learnt to ride aside. Naturally the question on all the lips: When could they try it on the pony they ride at the riding school? Many thanks to all those who supported the Horsham and District Riding Club 50th Open Annual Show. Area 8 have very strong, long-standing connections with this show largely thanks to Area 8 members Daphne and Keith Poupart. Keith was the show commentator and for many years you would have also heard his measured delivery at various Area 8 events and shows. Daphne was the schedule secretary and again in previous years she has served on the committee of Area 8 producing some wonderful newsletters. I have heard rumours that this was to be the last show for Keith and Daphne and after 50 years they have probably earned the right to step back. The full results are on the Horsham and District Riding Club website. Photographs can be viewed on the official photographer's website. Save the date for next year’s show which will be held on the first Saturday in July 2018. Our annual Summer Show was well attended, attracting many beautiful combinations to the wonderful venue at the South of England Show ground. It was fantastic to see both regular competitors and new partnerships too enjoying the range of classes. 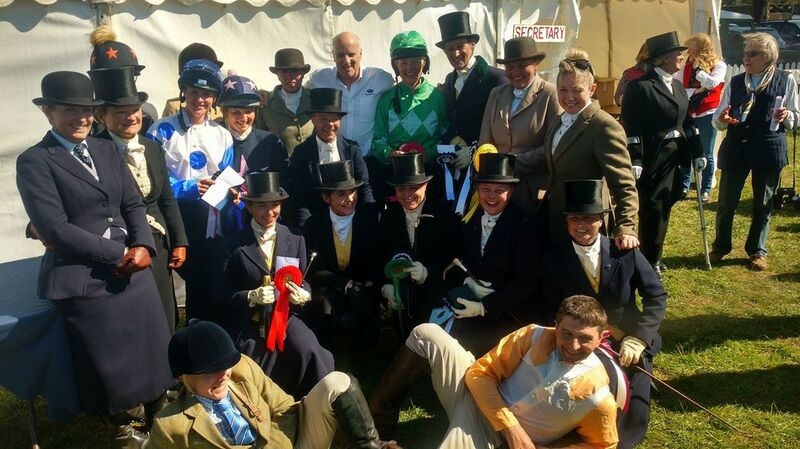 Thanks go to all who contributed to make this day happen, the many helpers, judges, stewards, sponsors, organisers, show secretaries, competitors, grooms and of course to our Area Chairman for all her hard work putting the day together. A special thanks must also go to Jess Crook. Unable to bring her own horse to compete, she provided the most wonderful handy pony course, the source of much enjoyment and laughter on the day! I'm sure we'll see this challenge again in the future! Wonderful! A full list of results have been published on our results page. 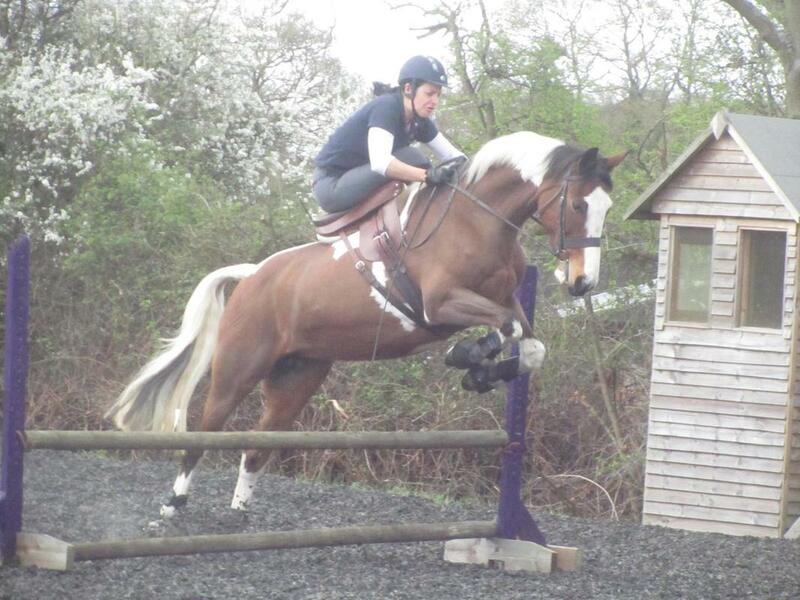 Many congratulations to Claudia Felstead on winning the beautiful Rocking Horse Challenge on her very first attempt! A small group travelled across the Channel to compete in France. Well done to Area 8 member Julia Izzard who won every class she entered! Our area 8 members joined other SSA members, flying the flag in style for GB while competing in Haras du Pin in early June this year. Area 8 members: Paula Keeley, Karen Dallyn and Julia Izzard certainly deserved the many prizes and rosettes they brought home. The standard of riding was understandably strong at this high profile competition which attracted competitors from around France as well as several neighbouring European countries. The back-up crews are kept busy throughout the entire competition and are an asset to all. Special thanks must go to Belinda and Miles Wilkins who served breakfast to SSA members on more than one occasion – thank you, very tasty! Following weeks of virtual meetings, one cold deep mid Winter day four intrepid ladies met up, huddled in the corner of a Cowden pub and discussed the mechanics of adding a Side Saddle Dash to the Southdown and Eridge Point to Point race timetable scheduled in April. The excitement grew as decisions were made and by the end of the meeting rules, eligibility and timetable scheduling were pencilled in. It was decided to invite Area 8 - the local Side Saddle Association members to put on a demonstration of side saddle riding to warm up the audience prior to the Dash. A piece was soon put together for marketing purposes with Dash proposals, photographs and timetable of events. This was circulated via social media and electronic web sites. 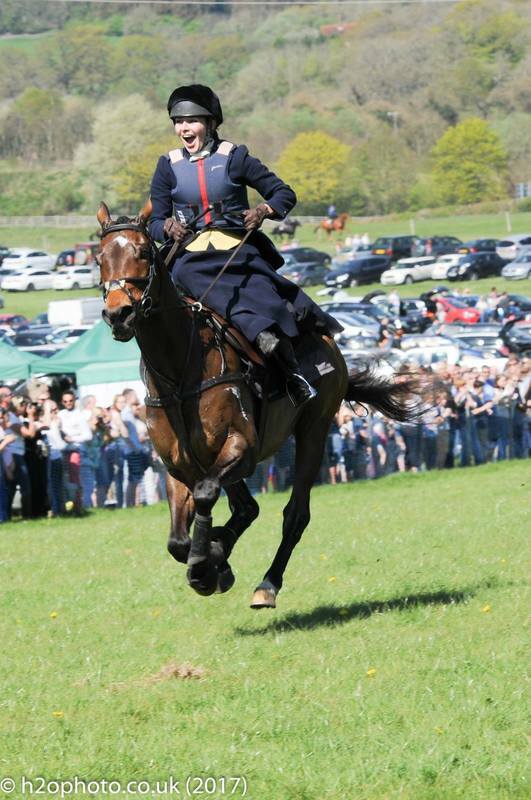 From the moment it went out the interest grew and soon the news of Side Saddle Puissance World Record holder Susan Oaks’ intention to come over from Ireland to compete went National. 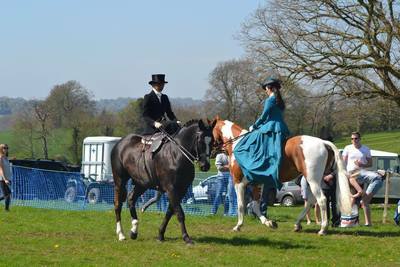 The four organisers were quickly inundated with interest, as well as general interest in side saddle riding. 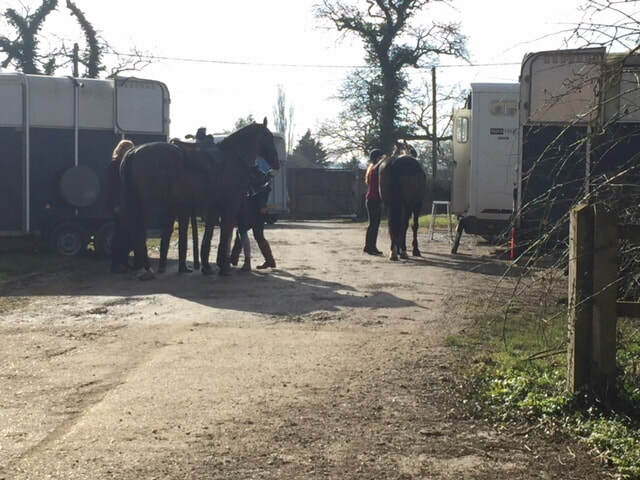 More meetings took place as the weather grew kinder, then the ghastly news broke that one of the team had been tragically killed in a freak riding accident – this left the team devastated but determined to continue in the same vein. Immediately a private sponsor came forward – without whom the Dash could not take place – and momentum continued. Heavy interest grew as did the entries which had arrived from local riders as well as places like Northampton, Suffolk and of course Ireland, leaving the organisers no choice but to close entries a week early on health and safety grounds – keeping a waiting list for the entries that continued to flood in. On the morning of Sunday the 9th of April, with the cars packed to the gills the organsiers arrived in glorious sunshine. There was a sense of excitement very early and this prevailed all day. Tailor dummies with side saddle costumes and habits were erected in the Side Saddle Association stand as well as saddles on dummy horses ready for the general public to ‘have a go’. Together with information and historical photographs on display. A replica of Susan’s huge Puissance 6ft 8in wall was erected amazing the general public and donations for the Kent, Surrey and Sussex Air ambulance were collected from all photographs taken. Lorries started to arrive and soon beautiful elegant Area 8 members on side addles dressed in historical costumes and habits were seen warming up ready for the display. Suddenly the crowd were enthralled by these riders who rode on the course much to the delight of a huge crowd. Commentary could be heard explaining the evolution of the side saddle and how the riders were able to ride in this way. The crowd were thrilled by the quality and beauty of riding and delighted to see some jump and remove an apron to display the pommels and leg position. Thanks to riders and stewards: Tim Pashen, Clare Cameron and Rowena Zelley. As soon as the display was over it was time for the Dash riders to come to the paddock. 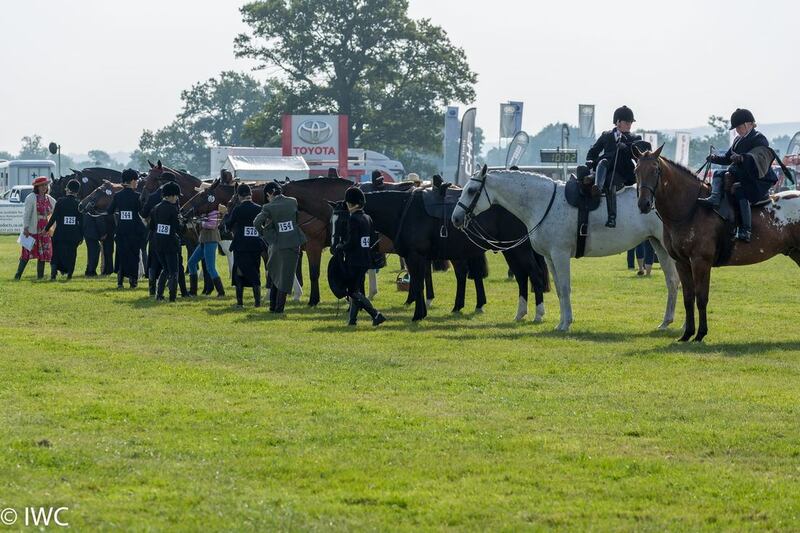 All shapes and sizes were there and the smiles were amazing, once settled they were led down to the start, girths checked by Jo Strange, Angela Wells and Clare Cameron and soon under starter’s orders. Then they were off, the Dash was over in under two minutes and won by Chloe Gunn [Area 12] from Dorset. All riders came home exclaiming they had had the ride of their lives, including both gentlemen riders, one being Bruce on his beautiful black stallion. 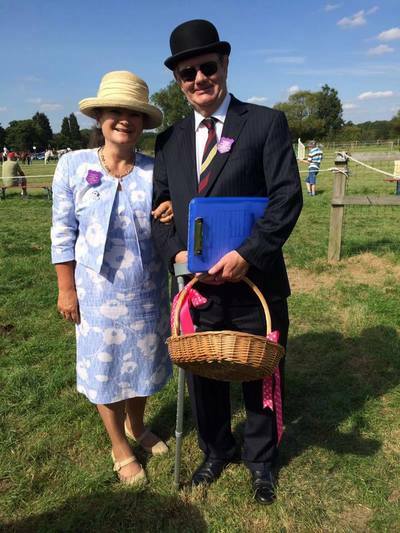 We were joined by ‘Wocket Woy and the Pwoducer’ who were eager to have a side saddle lesson down the course after the Dash, much to the delight of the crowd who gave them an enormous cheer – lesson kindly given by Susan Oaks! All side saddle riders were invited to the presentation of engraved whiskey tumblers from the Southdown and Eridge Point to Point races, SSA rosettes from National SSA and rosettes from local SSA Area 8 group which went to SSA members only. The demonstration riders also received engraved whiskey tumblers from the race organisers. A magical day was had by all and will certainly go down in history as one of the most enjoyable days for side saddle riders. Special thanks go to Sally Marks from South East Point to Point racing, Deena Poulton from the Southdown and Eridge, Geoffrey Worsfold for arriving at the crack of dawn and leaving last thing to man the stand, Miles and Belinda Wilkins for bringing saddles for display, Libby Lawson who brought her mechanical horse, Claire Lewis for bringing jumps and items for the stand, Ann Saddler for supplying habit on a tailor dummy, items of interest to the stand and spending the day speaking to interested members of the public, Sue & Tim Pashen for bringing tailors dummies and costumes to display on the stand – both also manned the stand and huge thank yous go to our wonderful members of Area 8 who showed the general public elegant, graceful riding proving what amazing riders they are. Thank you everyone who contributed to the day. In total the day raised around £10,000 which went to the Kent, Surrey and Sussex Air ambulance. We are planning to run another Dash on Sunday 15th April, 2018 at Godstone again next year! As the showing season approaches many riders turn their attention to side saddle classes and wonder how to get started. Nine intrepid starters did just this at the Jo Strange 'Have-a-go' clinic at East Grinstead. Each one had a sit on an electronic horse while Jo went through the basics, followed by saddle fitting and a beginners lesson. All came away having learnt a great deal and thoroughly enjoying their session, vowing to come back for more!! Thank you Jo for this day and thank you also to Angela and Rowena who also gave up their day to make this possible. Well done to all nine riders too! What a lovely day at Area 8's Claire Lewis Spring clinic. Lots of fabulous members were out enjoying their start to the season. Three full sessions varying in standards from beginners to well established partnerships. As ever Claire's expert eye was able to help everyone whether needing adjustment or a fine tweak. Claire can be relied upon to give an instruction at just the right point in time to make all the difference and today was no exception. Much was learned and everyone came away having achieved something positive. The promised showers stayed away and the sun shone, making a beautiful Spring day. Valerie Lewis was on refreshments and didn't stop once! What scrumptious cake! Many, many thanks to Valerie and Claire for such a superb clinic, great venue and friendly welcome, well done to all those who took part. Miles and I were very honoured to receive The Ralf James Trophy at this Year’s SSA AGM. Side Saddle has enriched both our lives. 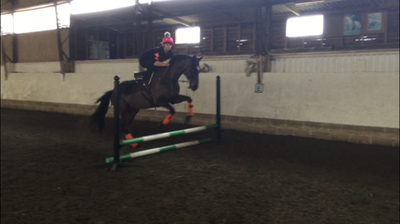 At first we just watched Caroline have such fun and success as a rider. During the twenty years we have been able to become more involved not just as spectators but as part of the SSA organisation. 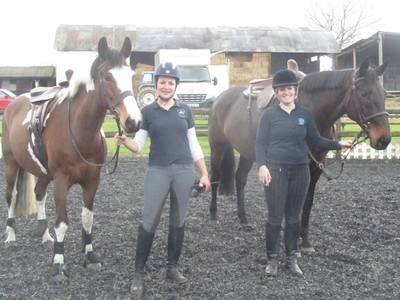 We have had much pleasure in helping to try and find a solution to the shortage of saddles. We have enjoyed playing our part on the Area committee helping with all needed. 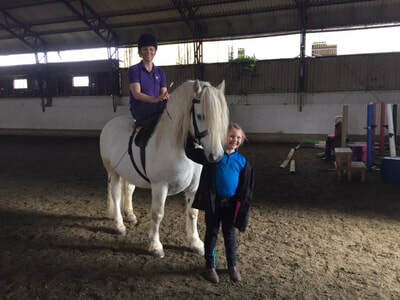 We have also enjoyed helping nationally in many different ways giving us magical memories taking us to places like the Filming of Downton Abbey, HOYS, and the opening Ceremony of the European Equestrian Games in Aachen. We have met a great cross section of members here and abroad and experienced moments that neither of us would ever have expected after simply dusting off my mother’s pony side saddle. Whether sponsoring or tidying up at the end of a show it all helps make the SSA run for the benefit of all. It is with great sadness that we announce the passing of one of Area 8's greatest ladies, Valerie Millwood, who slipped away on Thursday 23 March following illness. Valerie was one of Area 8's most ardent supporters and we all owe her a great deal. 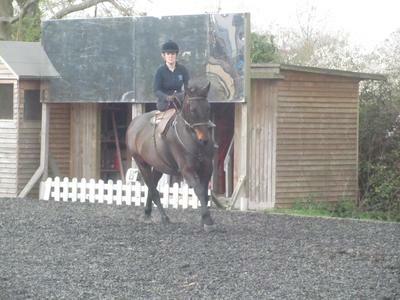 Side Saddle in this area and indeed further afield would not be the vibrant art that it is today with out her input. 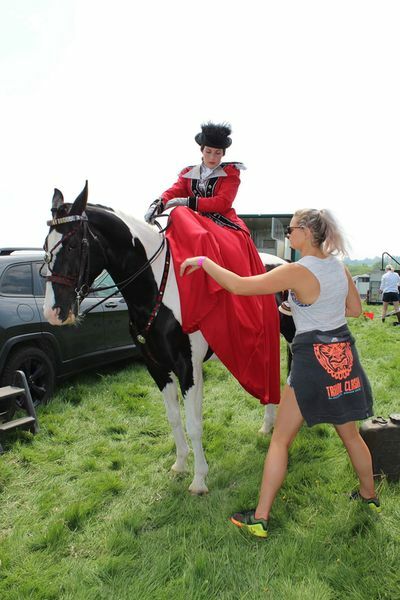 Her passion for all things side saddle oozed from her and she used this for great things such as her idea which came to fruition with the creation of the Ladies Classical class which eventually became an official class of the Association. She will be greatly missed by all who met her. Such a character. Valerie's funeral was held on Tuesday 11th April at St Mary's Church, Pulborough followed by refreshments in the local village hall where many friends gathered to remember and celebrate Valerie's life. Valerie wishes were for donations in her memory to be made to either the Injured Jockey's fund or Arthritis Research UK. SSA Area 8 member, former SSA panel judge and BSHA Vice Chairman Sue Webb lost her battle with life having been airlifted to Brighton Hospital, on Sunday 5th March due to horrific injuries sustained the day before in a freak riding accident out with the Mid Surrey Farmer’s Drag Hound’s last meet of the season, a pack where Sue’s husband Peter is the Senior Master and Sue was the Hunt secretary. Sue grew up in Nutley, East Sussex beginning her riding career at the age of 11 first riding locally on borrowed ponies, immediately proving she had a passion and great talent, then was lucky enough to have her own pony and began winning many competitions on her beloved: Brandy, who she loved to ride over the Ashdown Forest if not at a competition. Sue was quickly invited to ride a variety of ponies in various disciplines by professional showing breeders and producers. 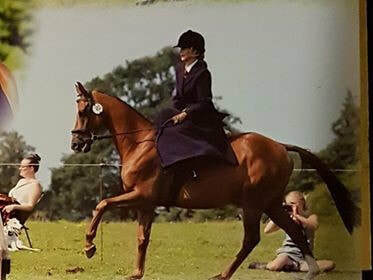 In her twenties she fell in love with side saddle and this took her all around the country showing horses in a variety of Ladies showing classes to great success, in particular she enjoyed to great success the Ladies Hunter classes. 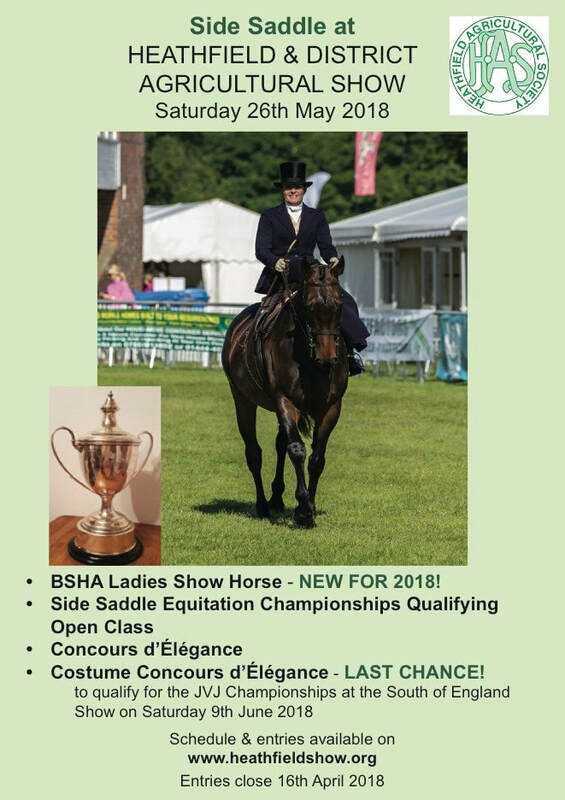 Sue wanted to share these experiences with other side saddle enthusiasts and worked tirelessly to create the current Ladies Show Horse class offered by the BSHA. Sue had a desire to bring the SSA and the showing community closer and again put time and effort into working hard to establish this with the idea of using the SSA Ladies Classical class as a qualifier for the Championship which she achieved and was delighted when an SSA and Area 8 member: Georgie Steele won the class last year at the BSHA Championship show. It is indeed fitting that Sue came and judged our own Classical Championship at The National Side Saddle Show in 2016. 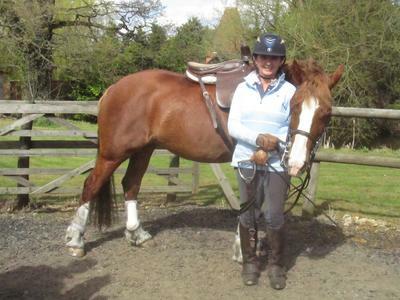 Sue had a great passion for grass roots in particular amateur owner/rider combinations and went out of her way to encourage newcomers to the equine world whether showing astride or side saddle. Sue helped her local SSA Area behind the scenes at clinics sharing her showing knowledge, judging at the Area show and working with local Agricultural show communities as well as supported her Area committee and Chairman. 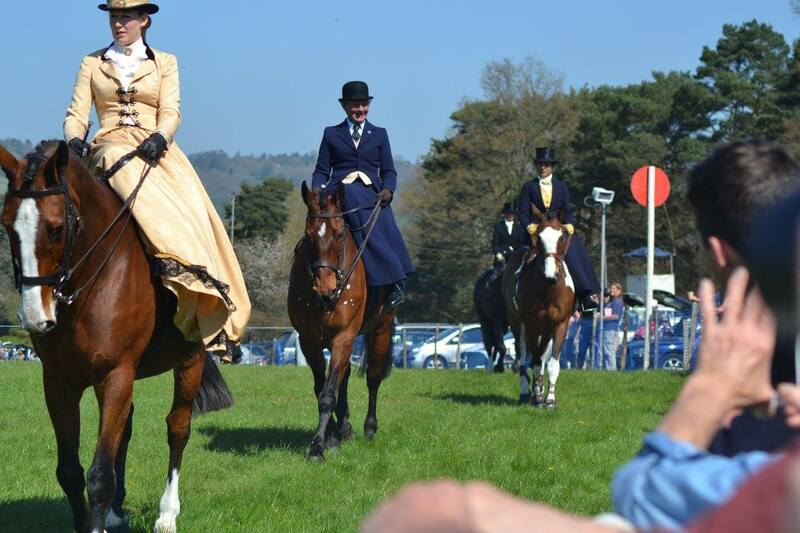 Throughout the Winter, Sue had been part of the team working ardently to bring a side saddle spectacle to point to point racing in the South East – the first since the 1920s. 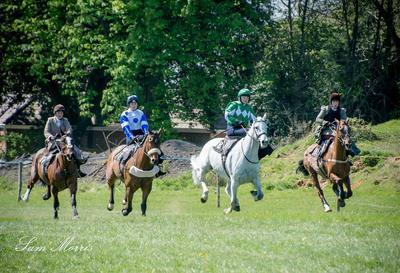 This went ahead having been re-named ‘The Sue Webb Memorial Dash’ in aid of the Kent, Surrey and Sussex Air Ambulance, held at the Southdown and Eridge Point to Point on Sunday 9th April, 2017 at Godstone, Surrey. Areas 8 collected for this charity and donations were sent to the Air Ambulance. Donations and sponsorship raised a total of around £9,000 which was a fitting tribute to Sue and all those who knew her. Sue was a keen sailor sailing from Eastbourne Harbour on her brother’s yacht as part of a competitive team, frequently calling herself a ‘winch wench’ as well as being a keen gardener. Sue was loved by so many people and will be dreadfully missed by her husband Peter, her son Chris, her parents, family and all who knew her. A private funeral took place in Nutley parish church, followed by a memorial service in Uckfield, East Sussex which was attended by many hundreds of mourners. Congratulations to all our Area 8 entrants! We are very excited to be able to offer a Paypal option for payment of Summer Show sponsorship. We are reliant of the generosity of our kind sponsors to help the Summer show to meet the ever spiraling costs and secure the future of this lovely event. We also have general show sponsorship available at £30. Names of all sponsors will go on the schedule ad we look forward to welcoming you there on the day. 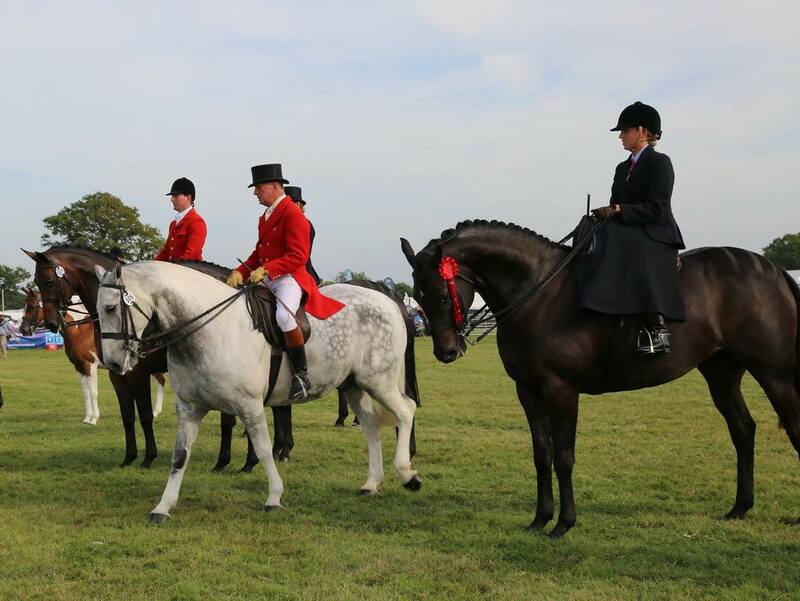 We have some very exciting news from Heathfield show this year: they are offering a new championship with amazing prize money and prizes! 7th - £25, 8th - £25, 9th - £25, 10th - £25, 11th - £25, 12th - £25. (incorporated within Class 159): The Well Acquired Perpetual Challenge Cup, JVJ rosettes, flower garlands and a showground photograph of their choice to the Champion & Reserve. Competitors who have qualified for this Championship will be notified by email. The Merlin Challenge Trophy & Junior Challenge Trophy, SSA rosettes& prize money. Our aim is to build on this JVJ Championship and we are thrilled that more shows will be granting us qualifiers this year, therefore, please give us your support and we look forward to welcoming you. For more information please contact: Valerie Knott, Mob: 07778511859, Landline: (01323) 304726 or Email: valerieknott777@gmail.com. You can enter online at www.heathfieldshow.org& please note that entries close on 11th April, 2017. Smiles all around at the side saddle 'Have-a-go' clinic at Priory EC, Frensham, Surrey instructed by Jo Strange . There were three groups of: complete starters, beginners and novice riders. 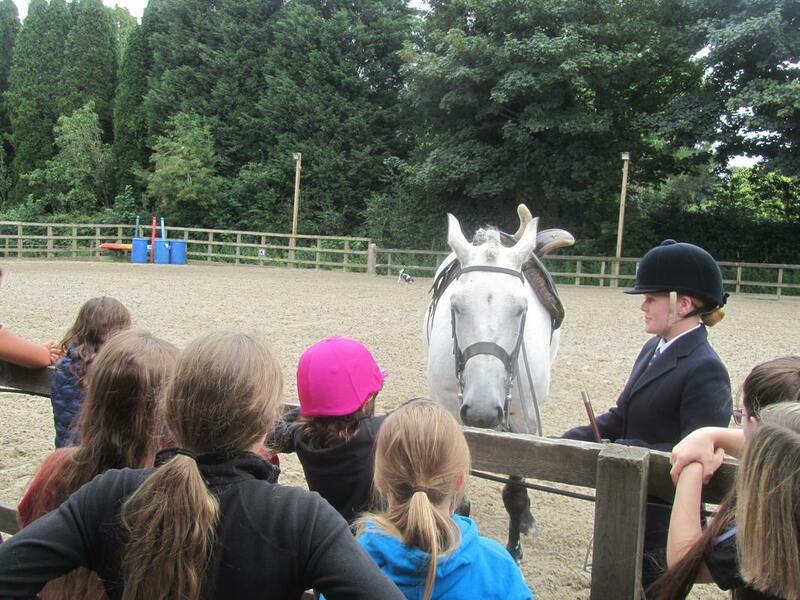 We were delighted to share our beautiful art of side saddle riding with complete starters who all took to it very well. Jo had a large selection of saddles, girths and stirrups to fit all. This was followed by a novice group who worked at a higher lever and the day was rounded off with a beginner group. Much was learned and all came away inspired and looking forward to their next session. Thank you to Jo, Angela, Sue and Amy who were busy the entire time assisting in a variety of roles. It was lovely to see Area 8 member Christine on her birthday who also enjoyed the day from the comfort of her chair. 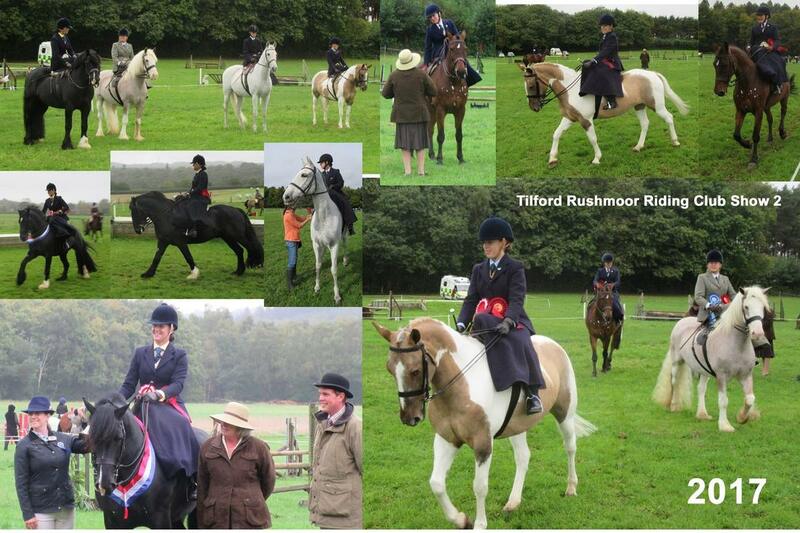 Well done to all those who attended and rode so well. Enthusiasm was in abundance! What a fabulous gathering of like minded people yesterday at Jennifer Roberts' beautiful period home in an idyllic location near Ashford, Kent. Members of Area 8 enjoyed many items of interest and reminiscing together with the common theme of 'Costume and Historical Classes' where they have come from and where they are now, this and other topics within the side saddle world were discussed in an informal dialogue. Everyone was able to contribute to the conversation with some very constructive suggestions raised which we hope to put into action in various ways for the benefit of the Area. We finished off with Nicola's illustrated talk on tack which included saddle, bridles and side saddle peculiarities through the ages. Special thanks to Pippa, Liz and Nicola. Also a huge thank you to Jennifer for her warm welcome to members, scrumptious cooking and her planning and preparation of such an enjoyable day - thank you very much. Snow was the word for the day! But thankfully it didn't stop play! Our wonderful Area 8 members braved the cold to meet up at Hilders Farm Equestrian Centre and enjoy insightful tuition from Area 8's Samantha Boxall, five times Rider of the Year title winner. Three well attended sessions saw a range of new and familiar faces. 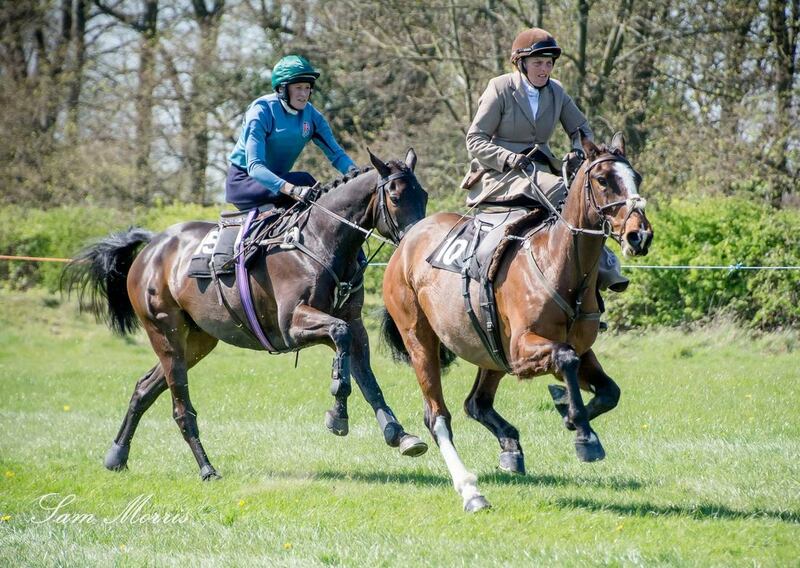 Some new partnerships and some novice horses, several having their first canter sideways. 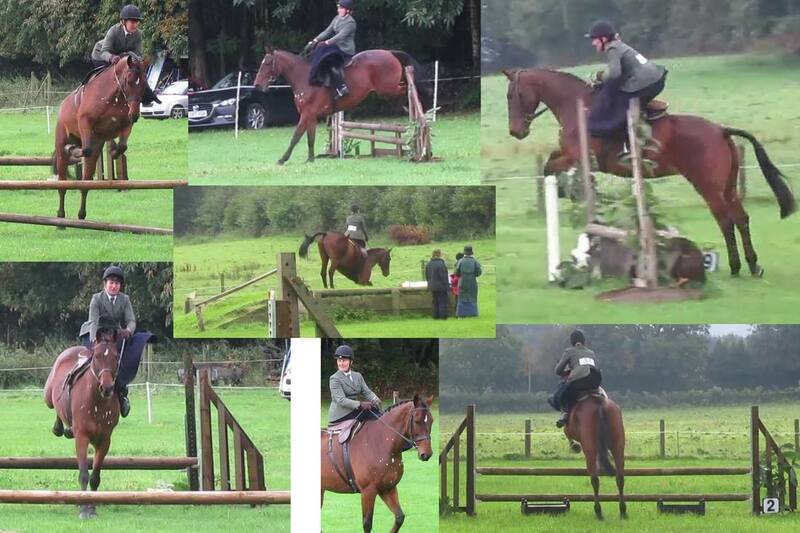 All the horses (and riders!) were impeccably behaved and everyone came away with a smile and having learned something! The jumping group focused on riding technique as well as how to ride a course and the improvement between their jumping rounds was clear for all to see - well done girls! We were also thrilled to welcome some new members along on foot for the first time. Fully inspired now, we look forward to welcoming them back with their ponies/horses next time. Well done to all who joined in the fun and a special thanks to Rowena who braved the cold for several hours trying to get the kettle to boil for tea! Full report and photos will be included in the quarterly Area 8 Newsletter which is distributed to all Area 8 members. The first social occasion of the 2017 calendar, the Area 8 New Year's Party is always a popular event. This year was no exception with tickets selling out well in advance of the day. A highly interesting and informative talk on costumes was given by Area 8's very own Rayna Matthews, winner of the National Historical class title on multiple occasions. Displays of beautiful costumes and multiple side saddle artifacts, a costume parade by juniors, Belinda's famous annual film show with modern day footage as well as some older clips and a delicious hot buffet style lunch were enjoyed by all. Many thanks to all those organisers and participants who made the day so enjoyable for all. On Sunday the 11th of September the camaraderie in Area 8 was in full swing. Members took to the Kentish grassy paths through the woodland, meadow and along the no through lane peppered with Elizabethan cottages and quaint cottage gardens on their way up to Chiddingstone Castle to demonstrate the beautiful art of side saddle riding as part of the Castle’s popular Autumn Country Fair. The weather was perfect along with the breathtaking costumes and two smart habits - making for a spectacle hard to beat. Members were greeted by an enthusiastic crowd as they rode up the drive, once in front of the Castle they lined up for a photo shoot much to the delight of Castle staff as well as visitors who were all snapping away from all angles. Along with Castle staff, Tim Pashen then separated the crowd to let the riders through to the East Lawn for the demonstration. In fine style, a recreation of Rotten Row took place with a joint parade followed by a work out to show off each individual costume finishing off with one ‘modern habit’. In particular we were really pleased to welcome our two 8 year old juniors: Isla dressed in a wonderful Scottish costume and Daisy in navy habit who earned an eager round of applause as they demonstrated ponies, having fun and a huge helping of side saddle enthusiasm in 2016, finishing off with Jess showing everyone what her legs were doing by removing her apron! Our audience appreciated a full commentary of side saddle history, Rotten Row, the Side Saddle Association, Area 8 and where we are in 2016 – with Angela Wells on the microphone. Special thanks go to our riders: Nicola Watson, Claire Battle, Isla Sturrock, Jessica Dutton, Sue Pashen and Daisy Morgan who all rode elegantly giving the huge crowd a marvel to enjoy. Our foot followers: Rebekah and Andrew Marks-Hubbard, Martin Sturrock, Jo Pashen, Clare Cameron and Kathleen Botting all added to the atmosphere of the day modelling costumes of the time as well as one of our chief stewards: Tim Pashen adding a certain status to the proceedings in bowler hat. 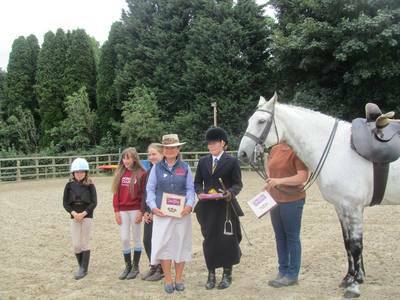 Area 8 special commemorative rosettes were awarded to all who took part. Once the formalities of the day are over the ride back to the parking in Well Field is an easy relaxing experience for all to enjoy. Once horses and ponies are away it is time for scrumptious cream teas for anyone who came back to the Castle on foot. The Area 8 stand decked out in side saddle memorabilia, saddles, costumes and habits was in attendance too, ably manned by Geoffrey Worsfold, Julia Izzard and Kathryn Campbell who all welcomed a perpetual flow of enthusiastic members of the public - one of whom is a presenter of Antiques Roadshow eagerly wanting to know more - who had seen the demonstration and wanted to say how much they had enjoyed it. 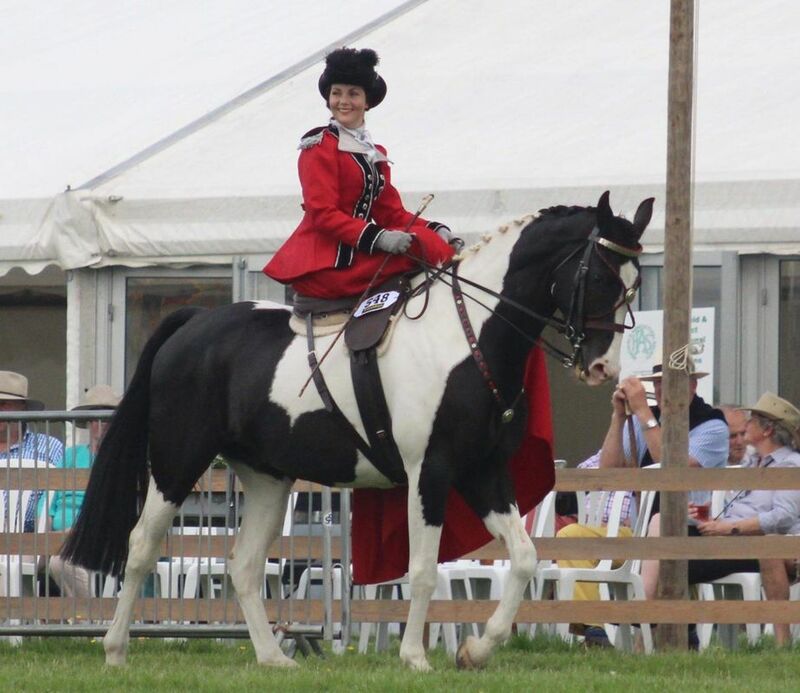 Also on the stand came potential new members who had made a special visit to the Country Fair to find out more about side saddle – we look forward to welcoming these people to other Area events in the future. Well done to Isla Sturrock who brought her dog back to the Castle and, after her cream tea, went on to be awarded more rosettes in the dog show! The whole day is an exceptional experience for everyone involved, especially as the Castle sits perfectly in the middle of the Area making it very accessible for all. The idyllic location sets the scene and lends itself well to our art of riding and the crowd are so appreciative of our efforts. 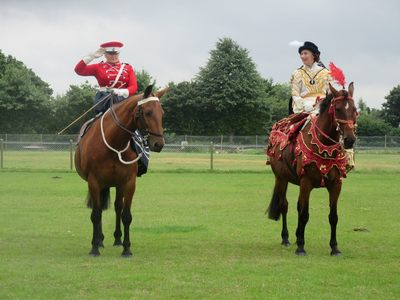 A very nice thank you letter has been received from the Castle thanking us all for a wonderful display which they say ‘Our side saddle demonstration attracted the largest audience of the day’ – no surprise I hear you say! A very special thank you must go to Rebekah, Sue , Andrew and Tim who are the ride chief stewards and keep everyone safe for the whole duration, without these members the ride would not take place, nor the demonstration. This day is a memorable one for all who took part and we can look back with pleasure on such an unimaginable amazing day.